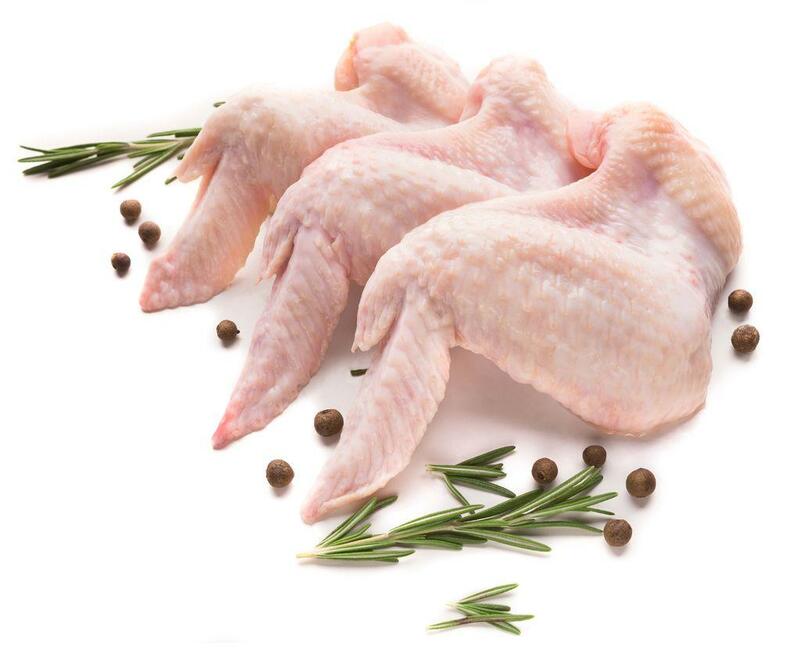 Foodmate developed a new high yield wing cutter to better handle large birds, birds with a missing wing, and damaged birds. 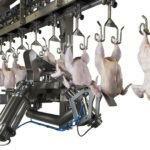 The machine has a very open design to allow birds with one wing, or damaged birds to easily pass through the machine without clogging the machine and stopping the line. 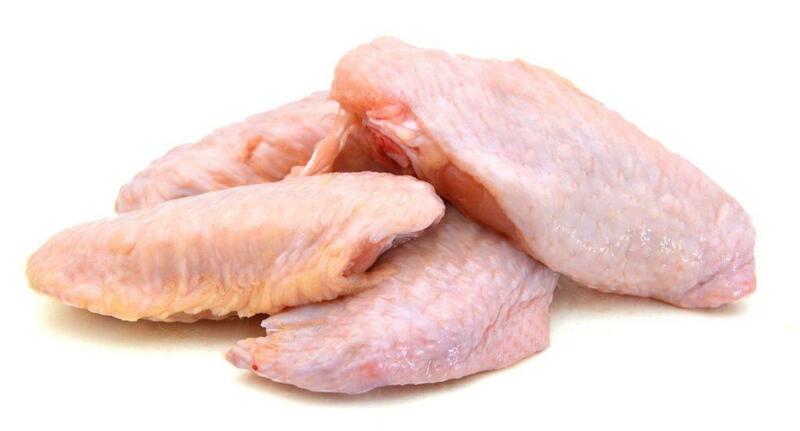 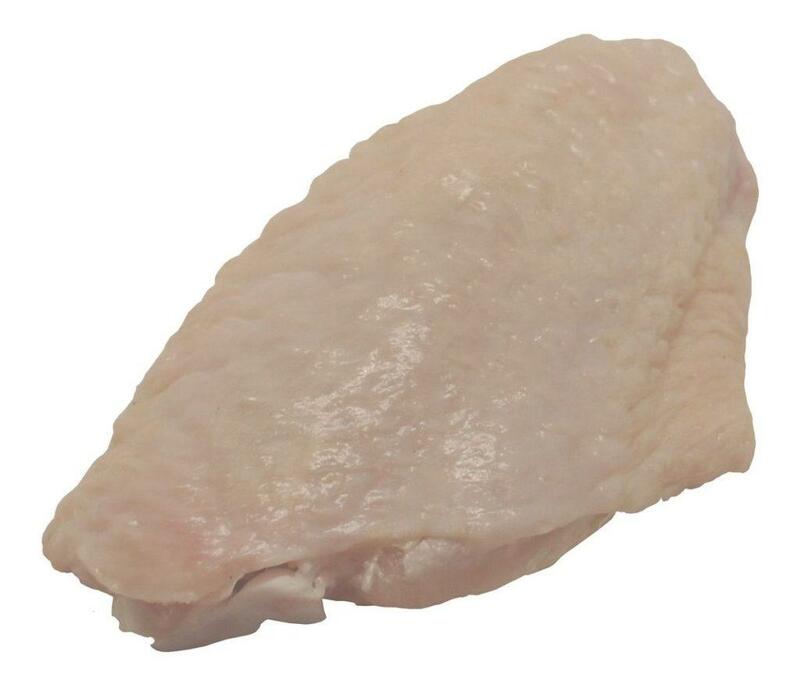 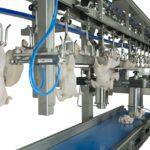 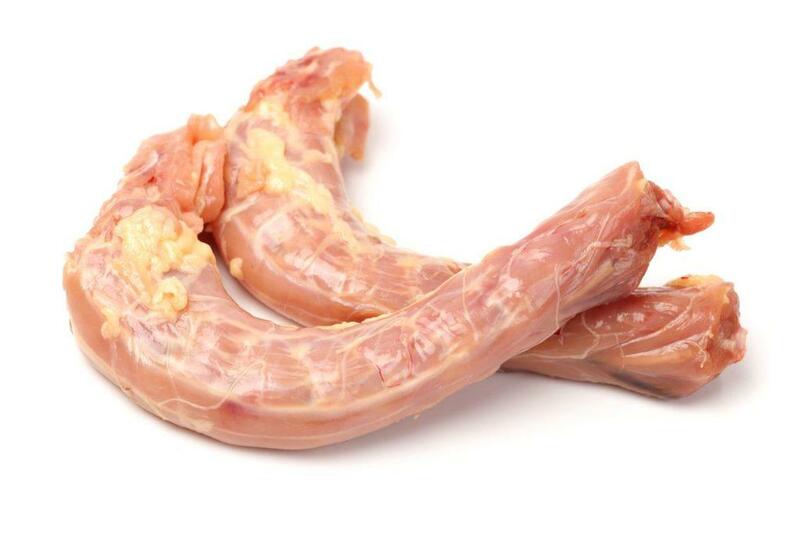 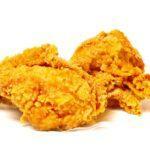 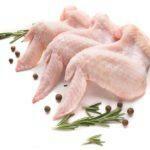 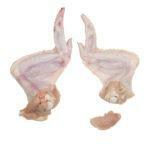 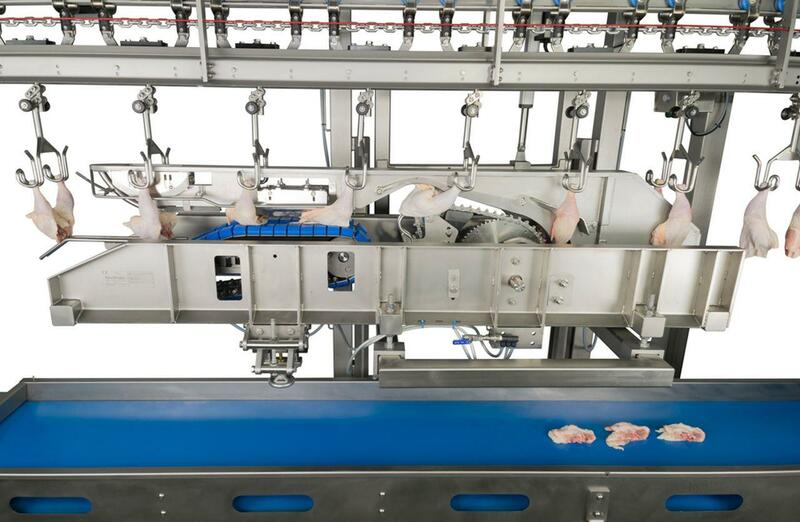 The machine creates an anatomical cut with the option to optimize wing yield by leaving the back meat on the wing. 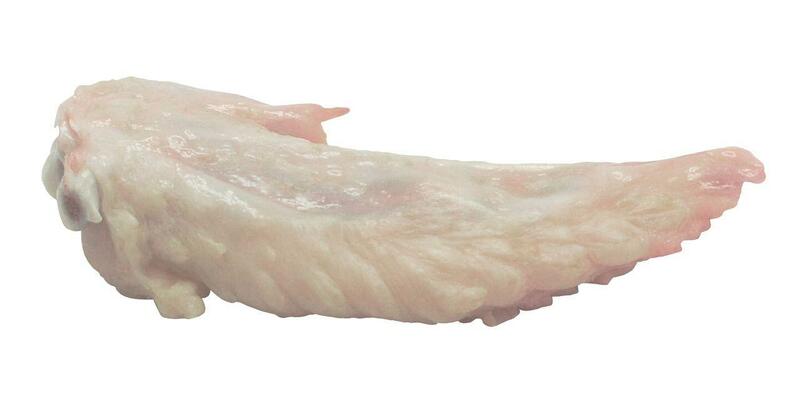 The Foodmate Wing Tip Cutter cuts the tip from the mid-wing piece. 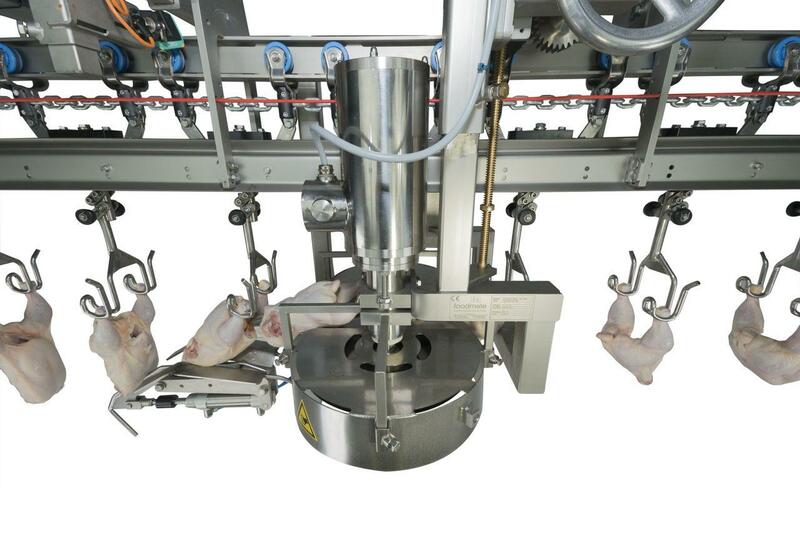 The machine is developed to accommodate common bird sizes and gives an optimal yield on wing meat, while ensuring high cutting accuracy. 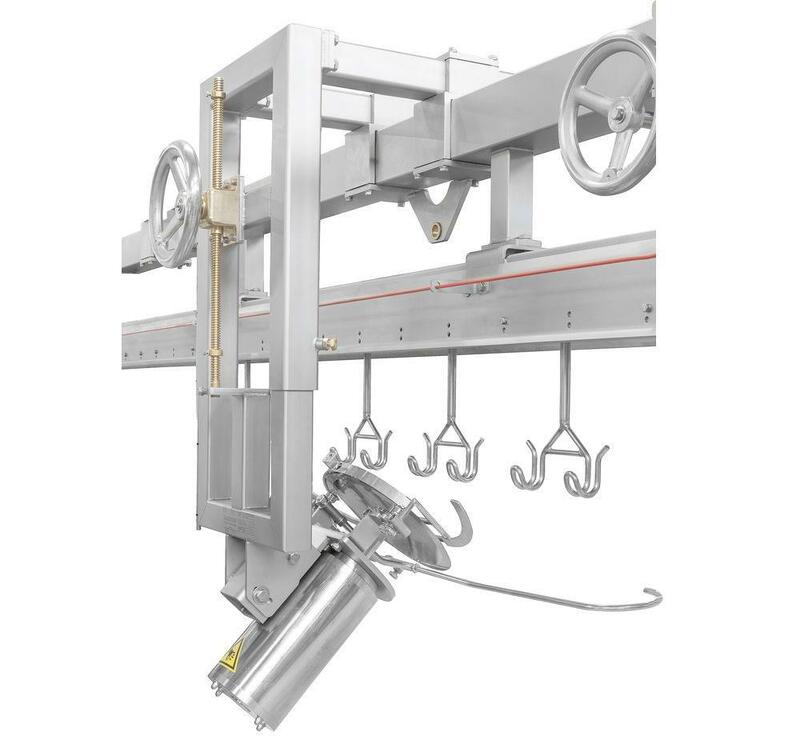 The Wing Tip Cutter can be installed on current figurations or newly constructed Frame and Flex Lines. 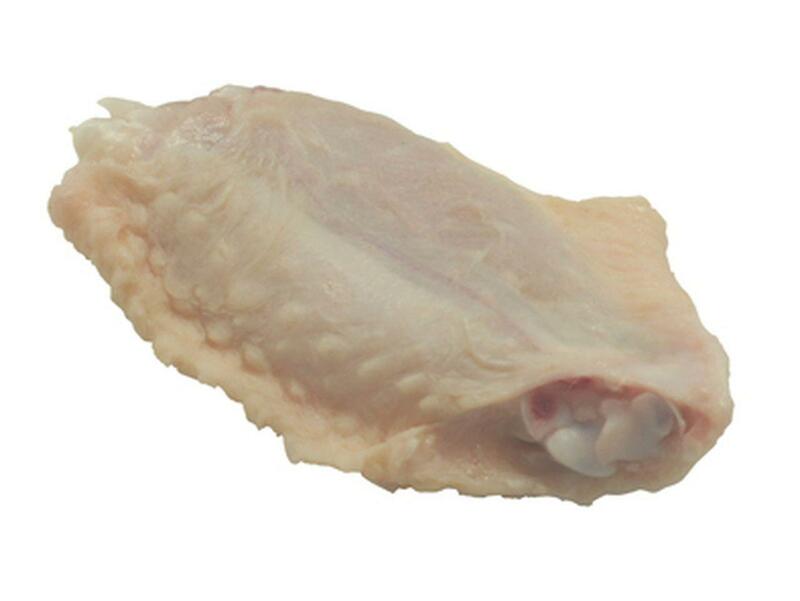 The Foodmate Mid Wing Cutter was designed to separate the mid wing piece (flapper/median) from the wing drummette, also known as the first joint piece. 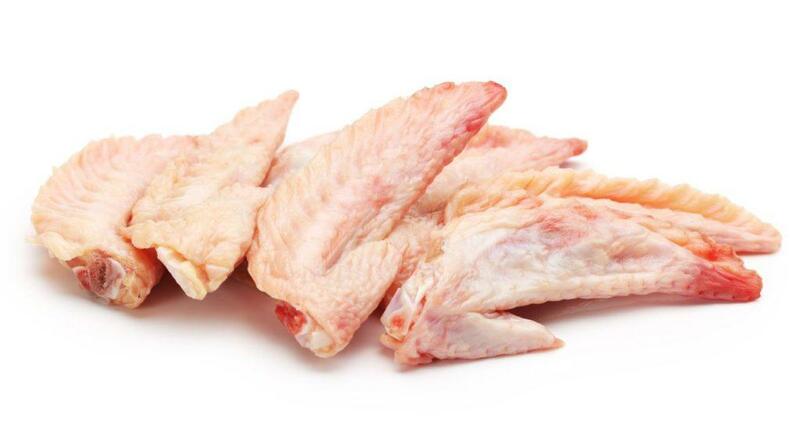 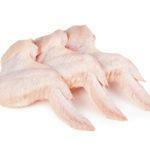 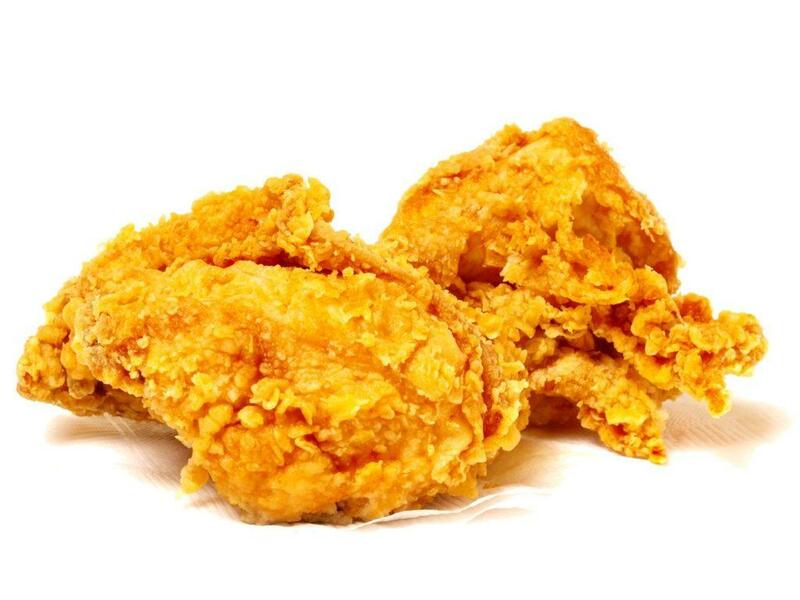 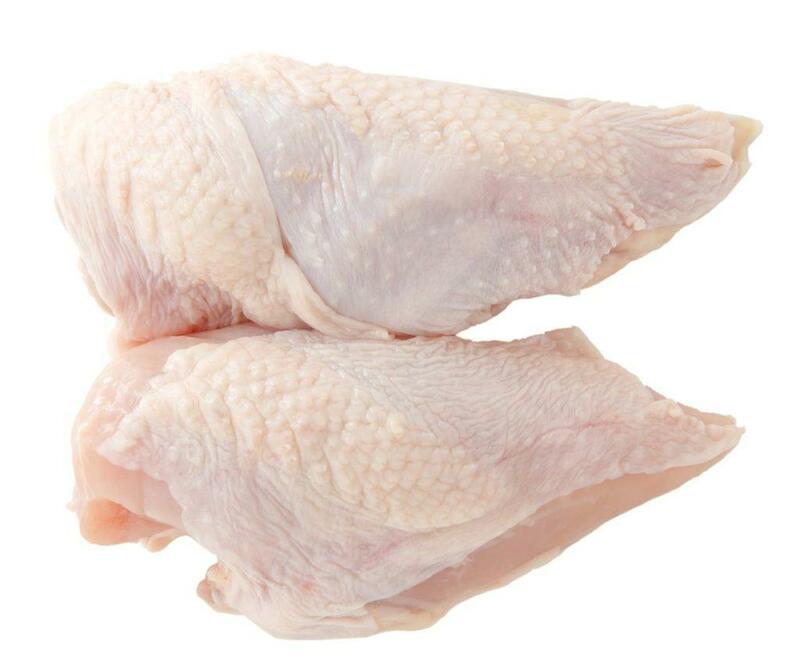 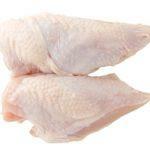 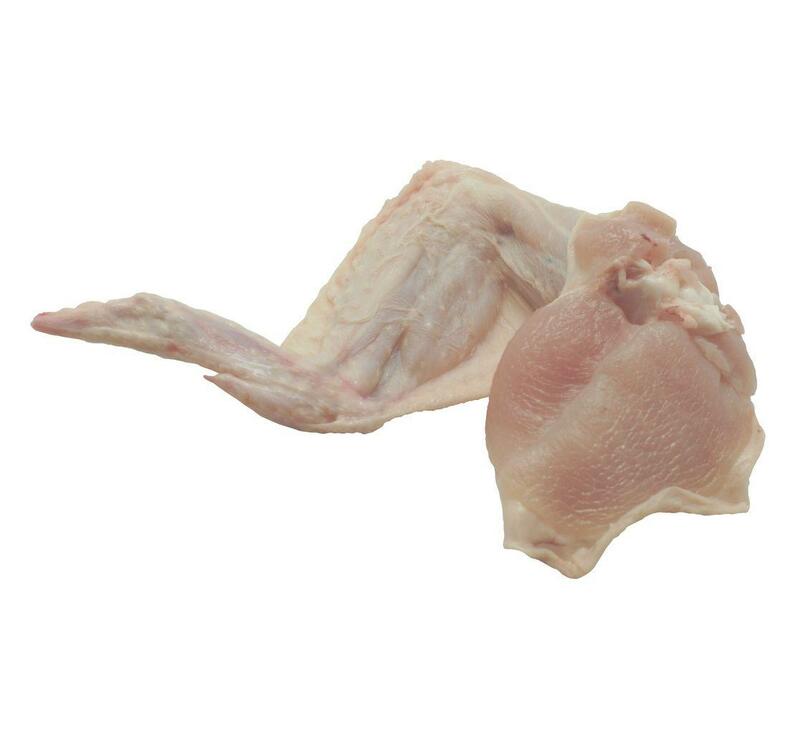 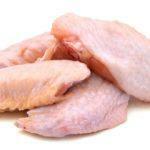 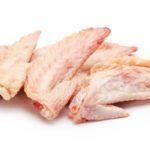 The machine cuts through the center joint of the chicken wings and can be used on chickens with or without the wingtips. 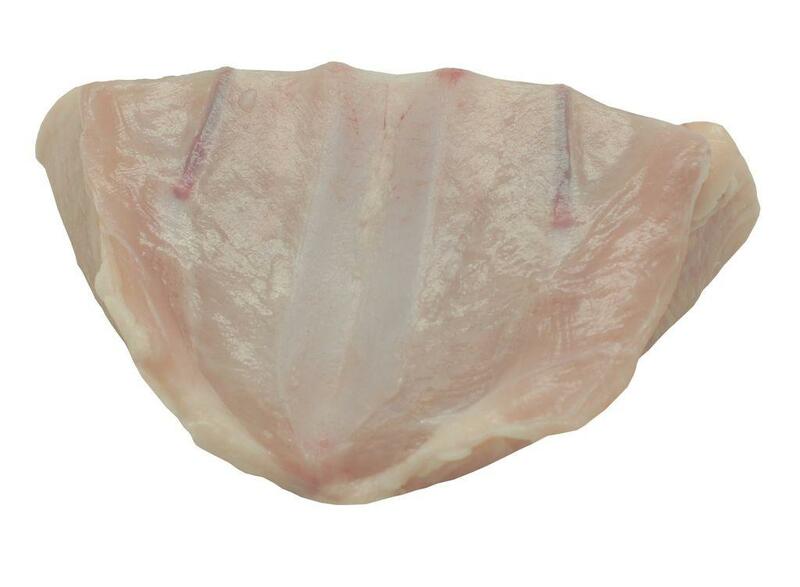 The Foodmate Breast Processor is designed to produce split breast or whole breast with or without back. 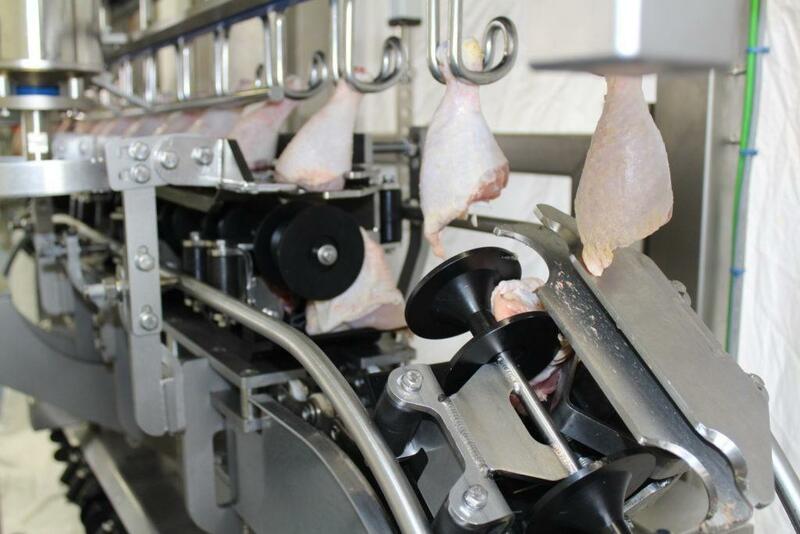 The machine has unique design features that allows for accurate cuts and minimizes the chances of birds clogging the machine. 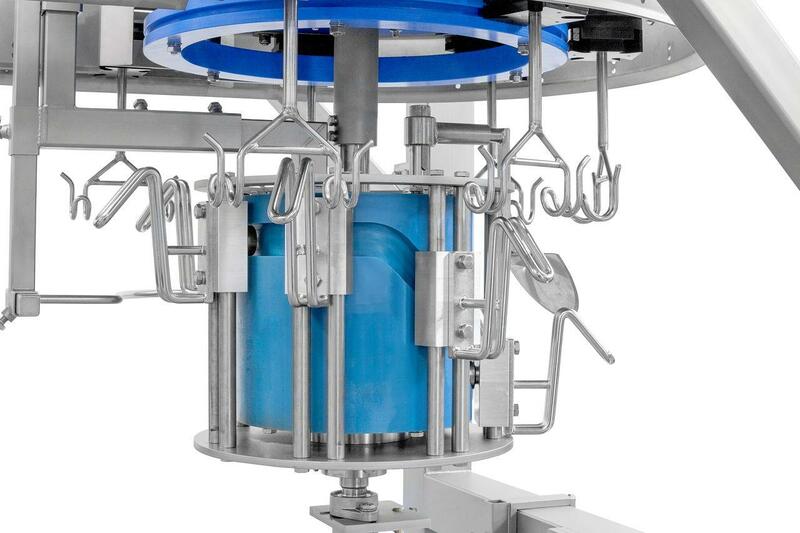 The Breast Cap Cutter separates the breast cap from the back piece. 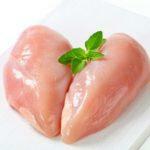 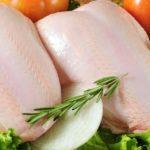 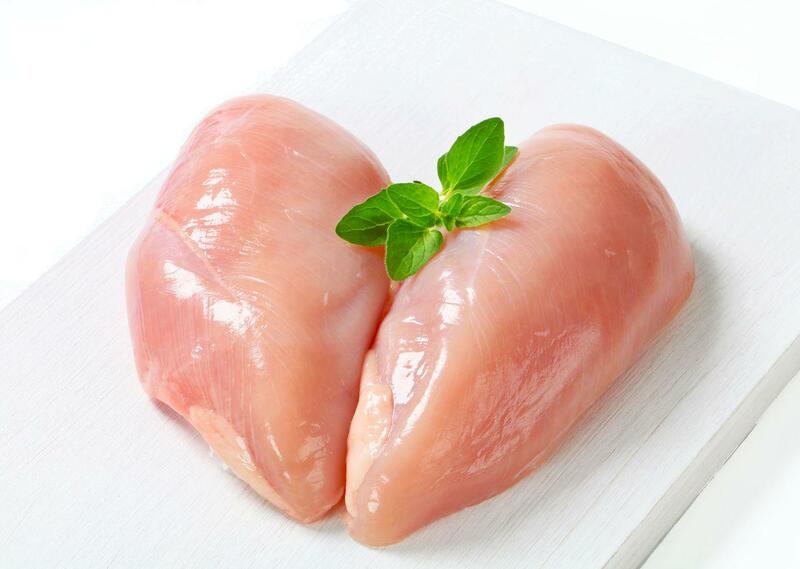 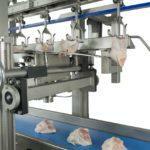 The machine gives an optimal result with a minimum loss of breast meat and can be easily adjusted to various bird sizes. 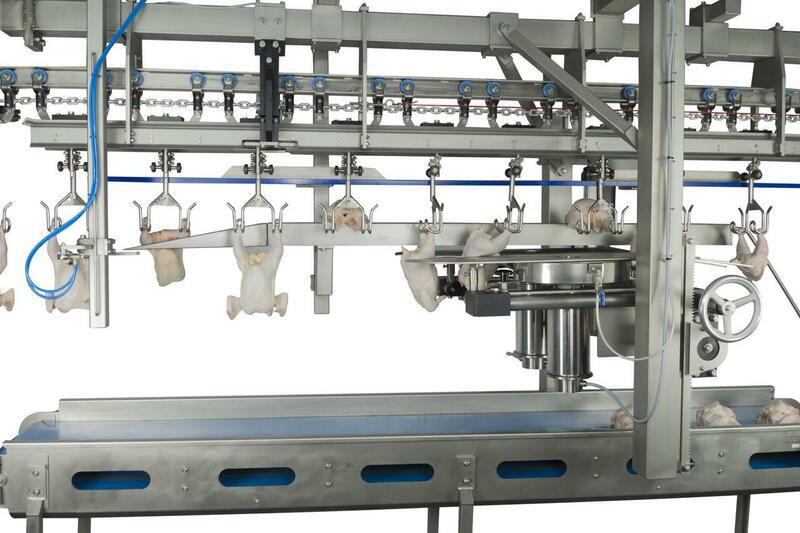 The height of the machine can be adjusted to bird sizes by rotating the spindle. 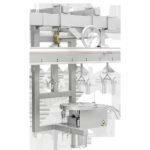 This module addresses challenges commonly found with single bladed front halving machines. 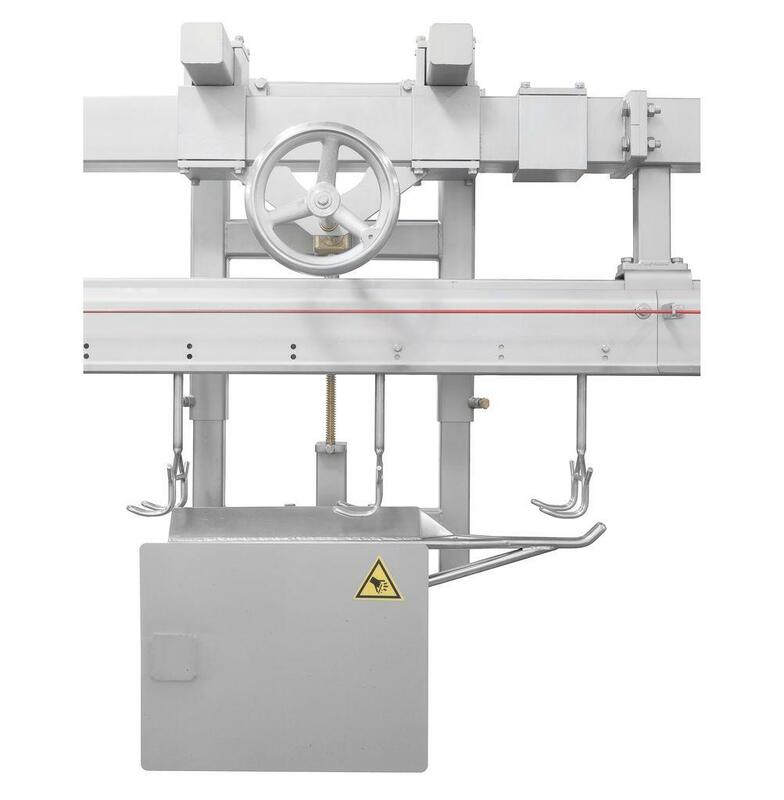 The FH Cross-Cut Halving Machine provides a highly efficient cross-cut front half, significantly reducing the amount of tipped keels and miscuts. 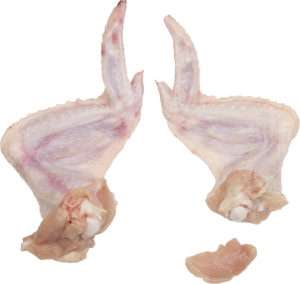 Using two blades instead of one large blade gives a straighter cut across the hips and gives more control over the number of ribs that stay attached to the front half. 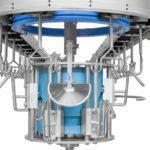 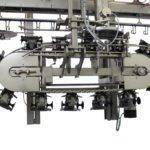 The FH Cross-Cut can run both on 12” and 8” centers, and it can process a large size variation without adjustment. 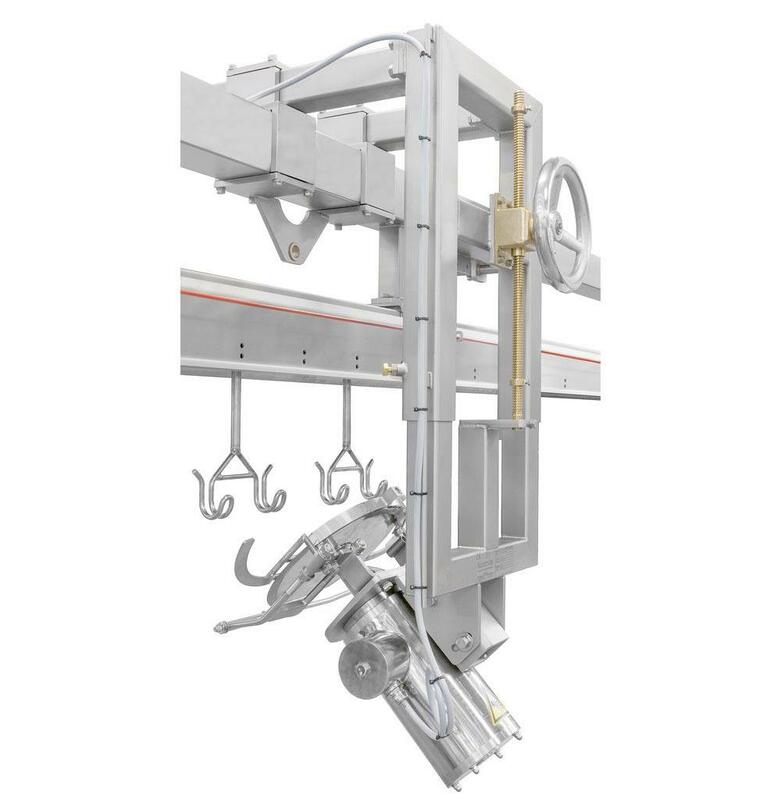 Its versatility allows for installation on current line configurations or newly constructed frame or flexible cut-up lines. 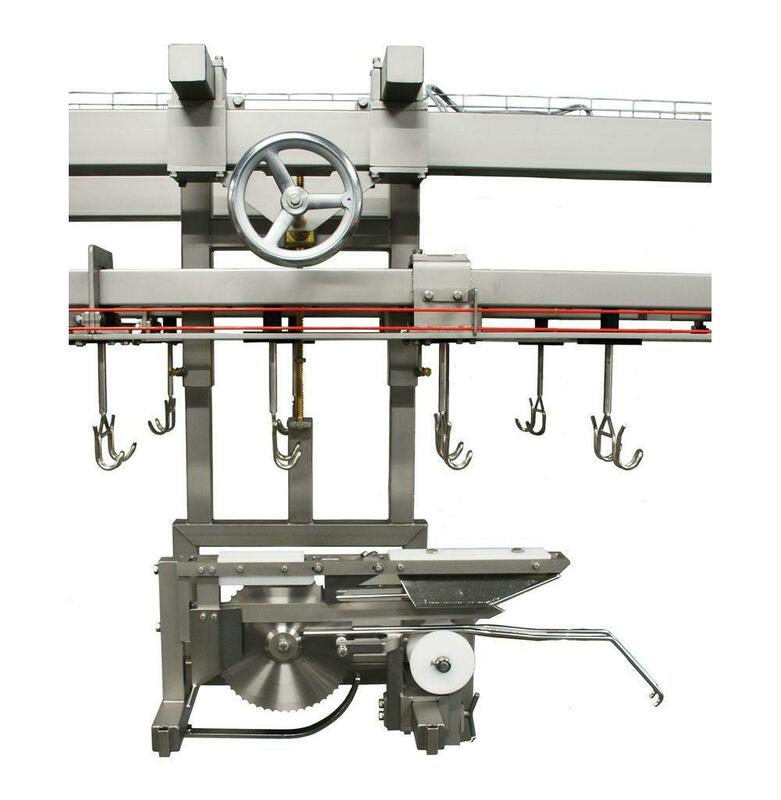 With the FH Cross-Cut Halving Machine, there is no need for a pre-cutter, in addition, the machine has a direct drive design with no belts and easy maintenance. 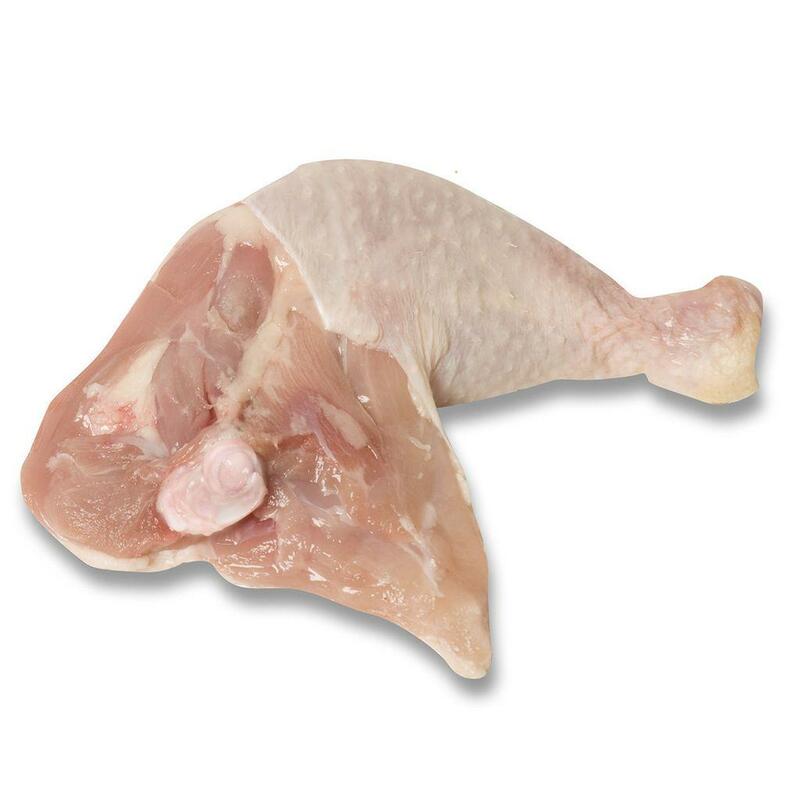 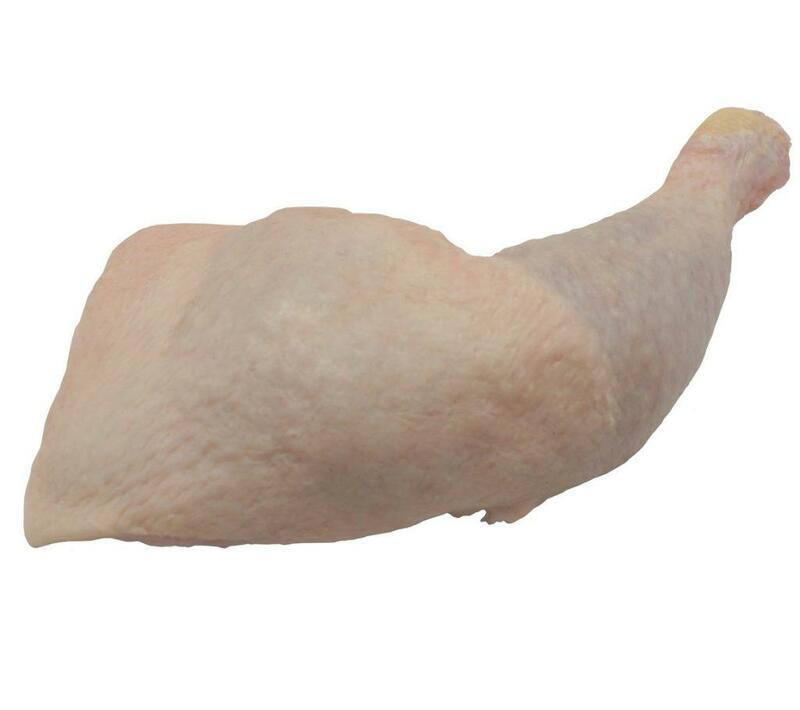 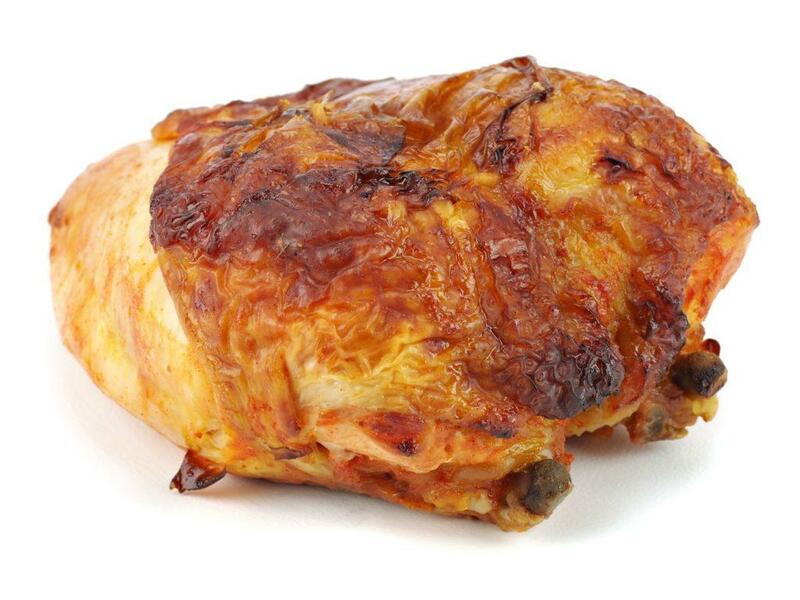 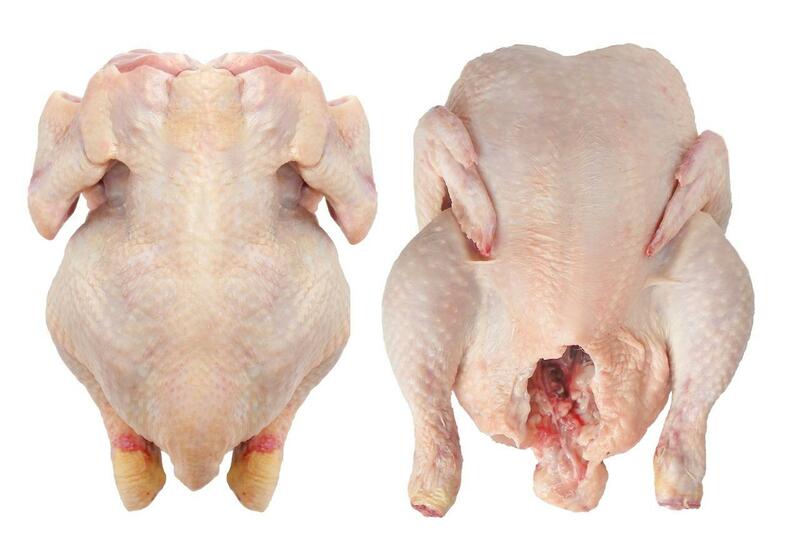 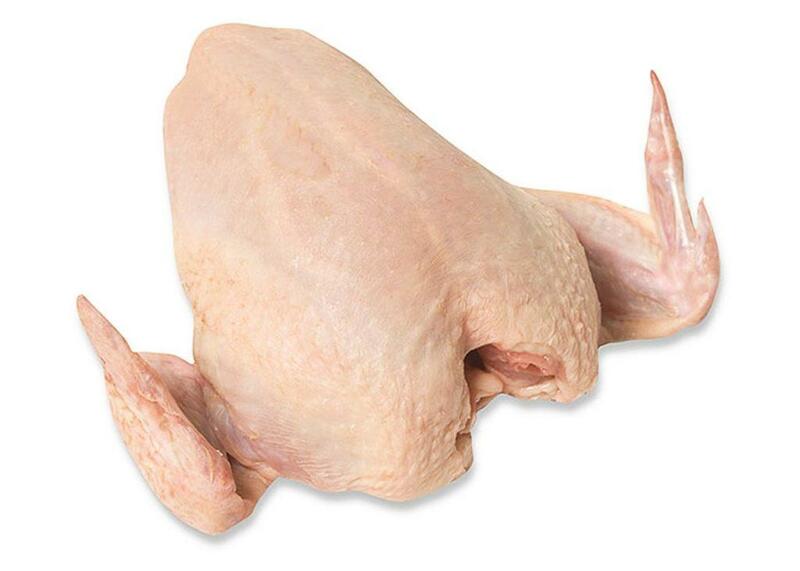 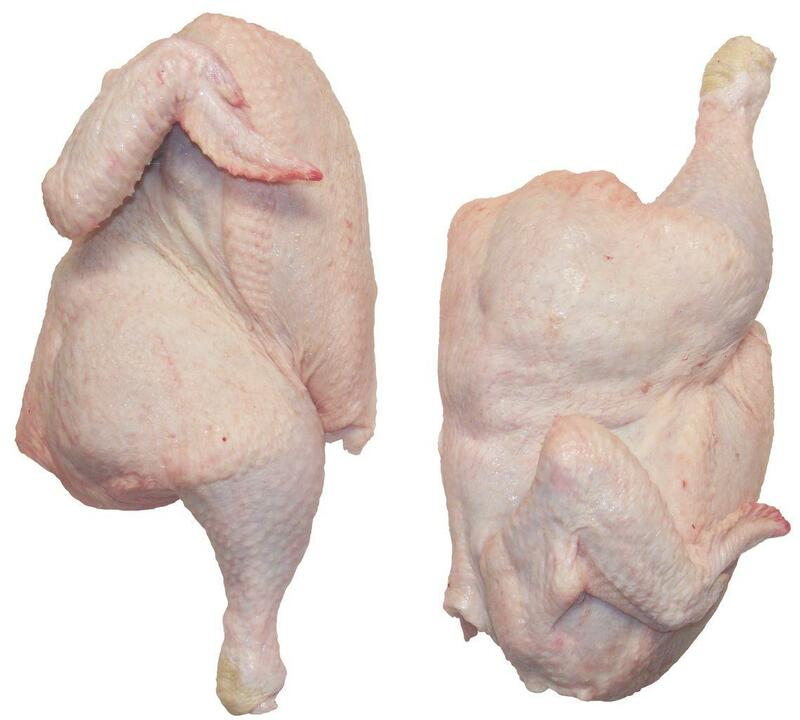 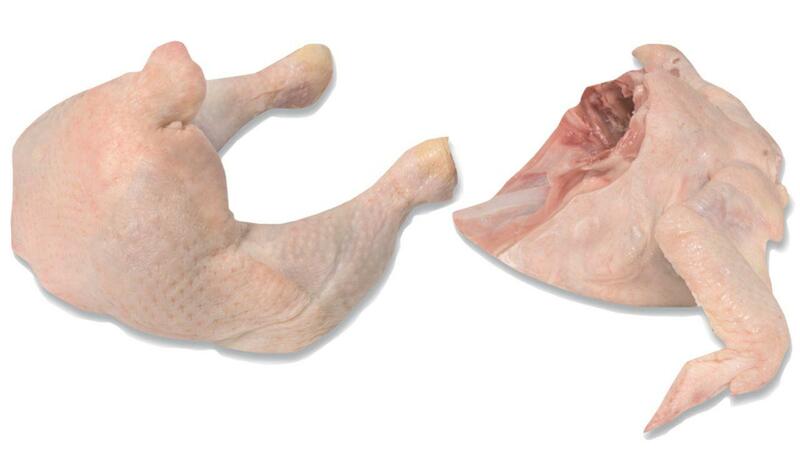 This module separates the front half from the chicken. 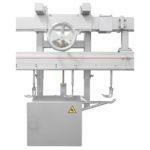 The machine also can be used to cut off the remaining backbone piece after using the FM Front Piece Cutter. 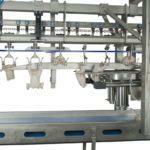 It requires minimal maintenance and is easy to clean. 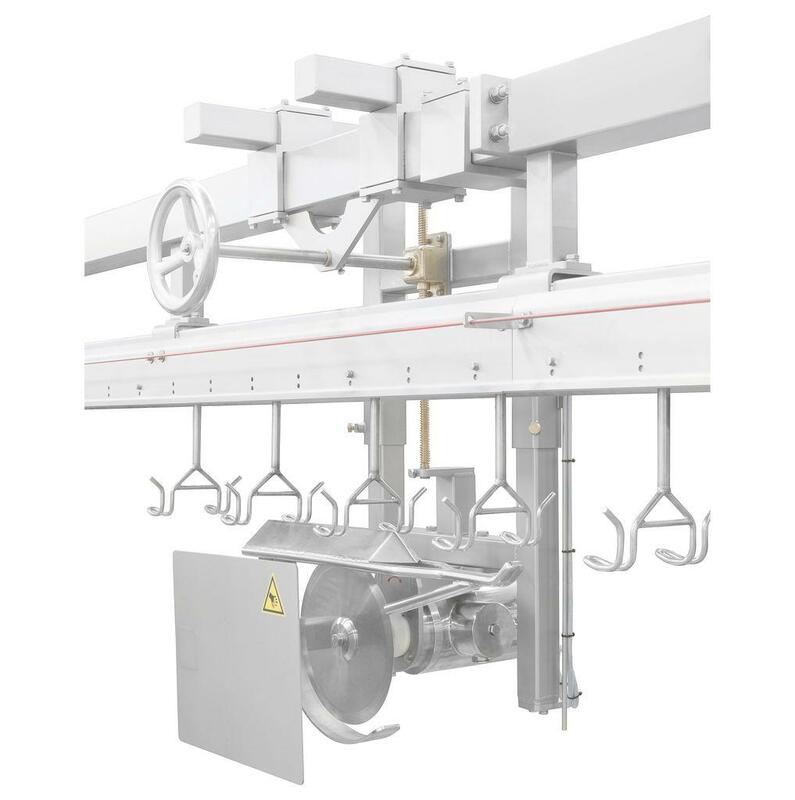 The Single Blade Halving Machine can be installed on current configurations or newly constructed frame and flexible lines. 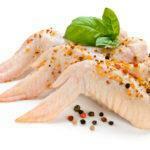 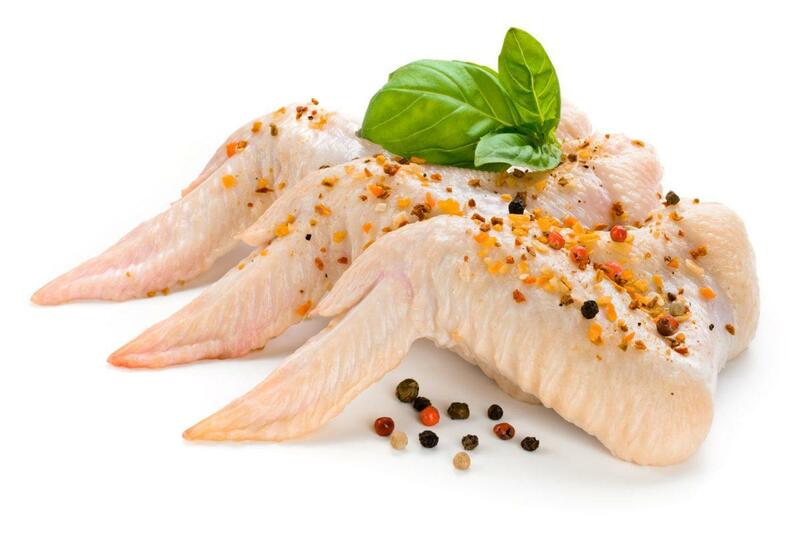 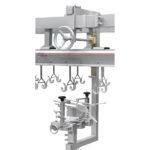 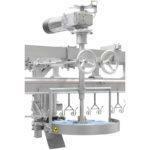 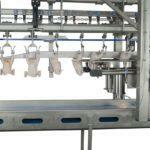 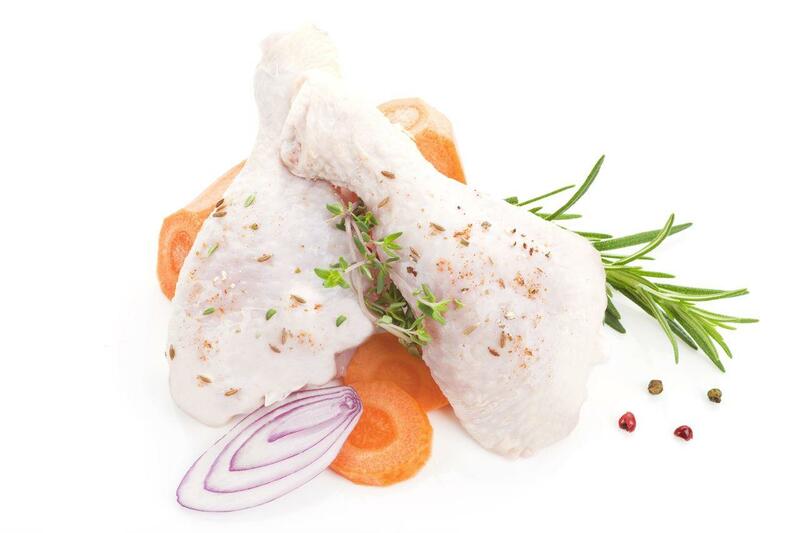 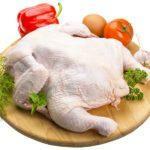 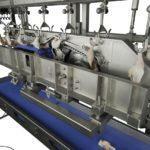 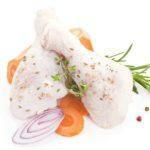 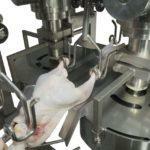 The Foodmate Lengthwise Halving Machine splits the bird into two equal length halves. 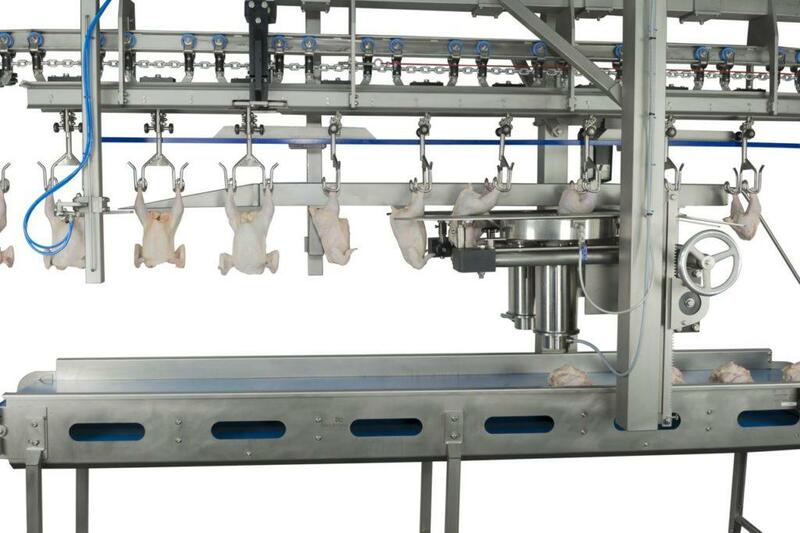 The machine can be adjusted to several bird sizes. 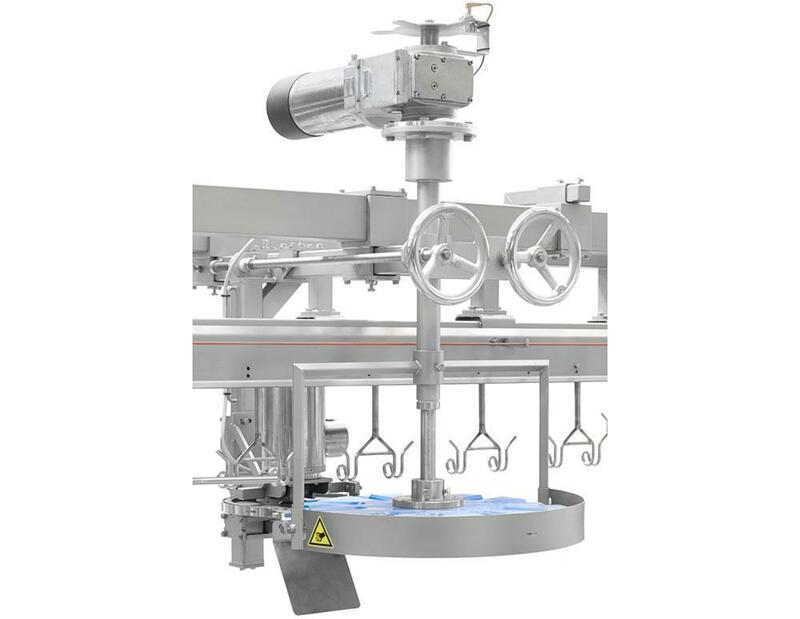 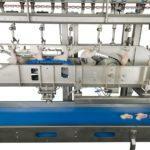 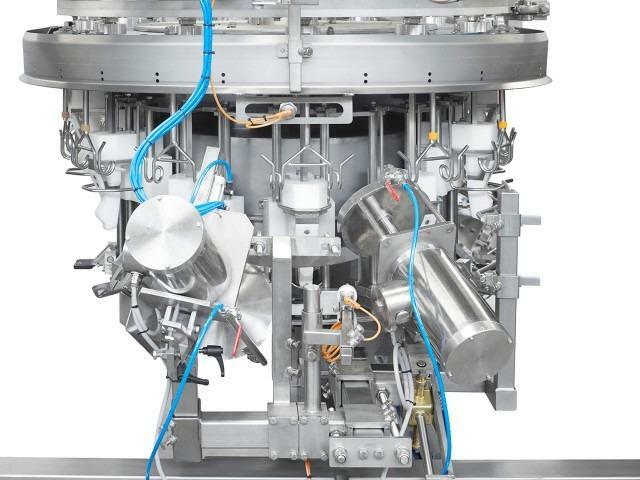 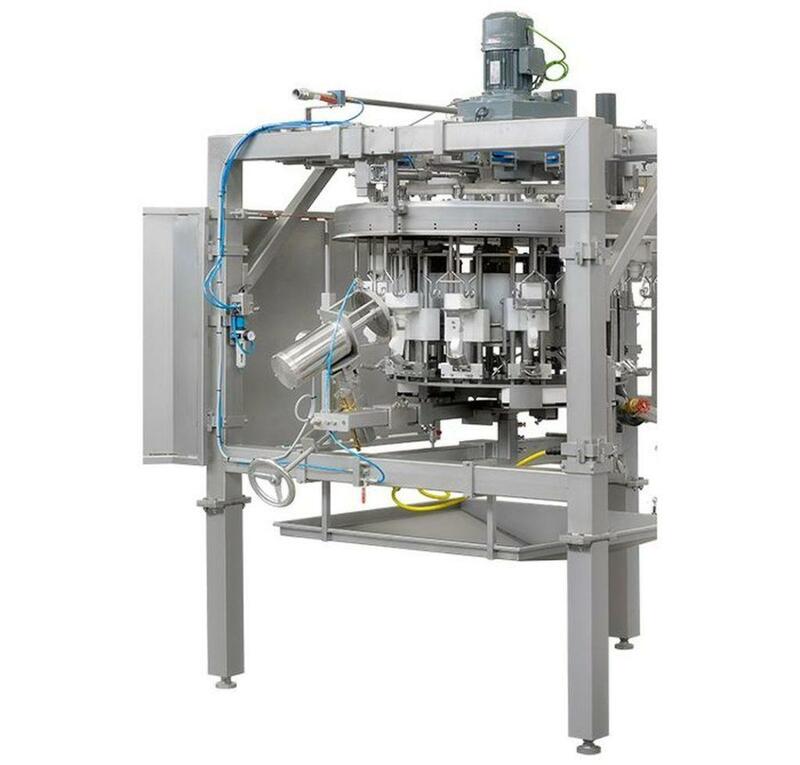 The Foodmate Lengthwise Halving Machine gives the highest accuracy to get two identical halves. 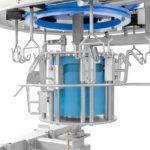 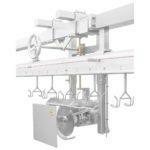 It can be installed on current figurations or newly constructed Frame and Flex Lines. 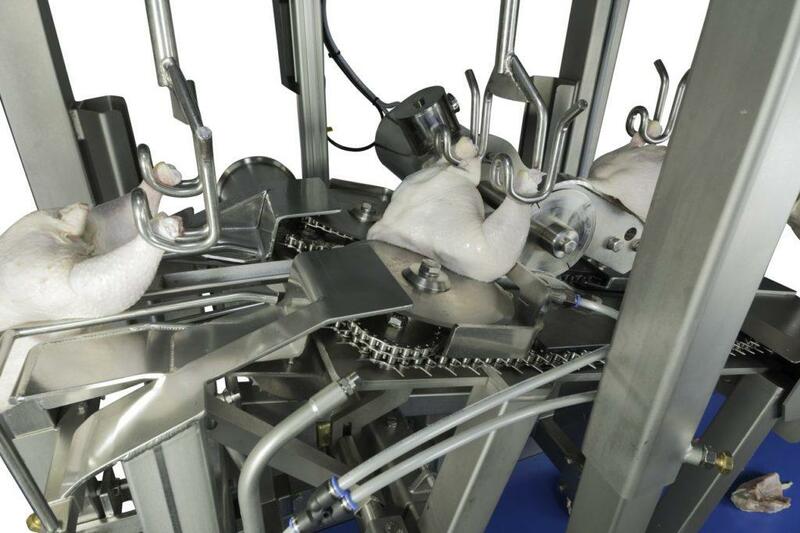 The leg processor accommodates a wide size range while maintaining a high percentage of “white knuckles” and minimal bone content. 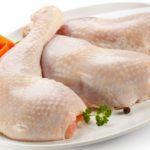 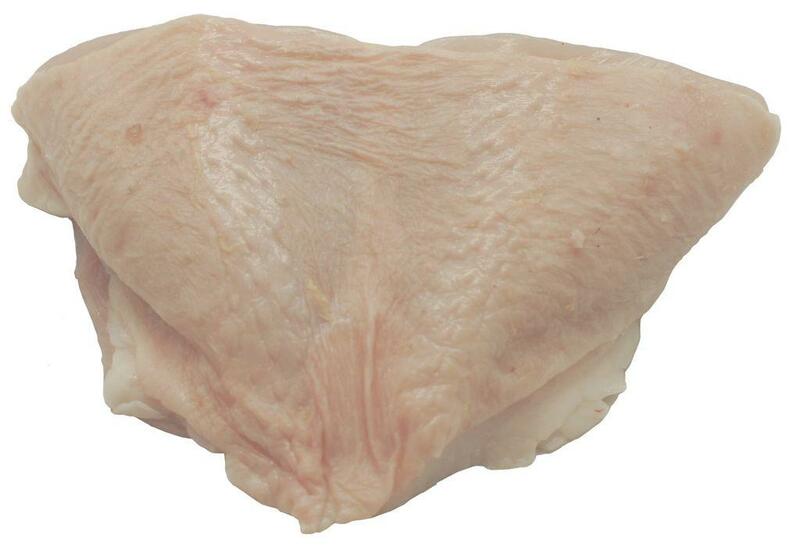 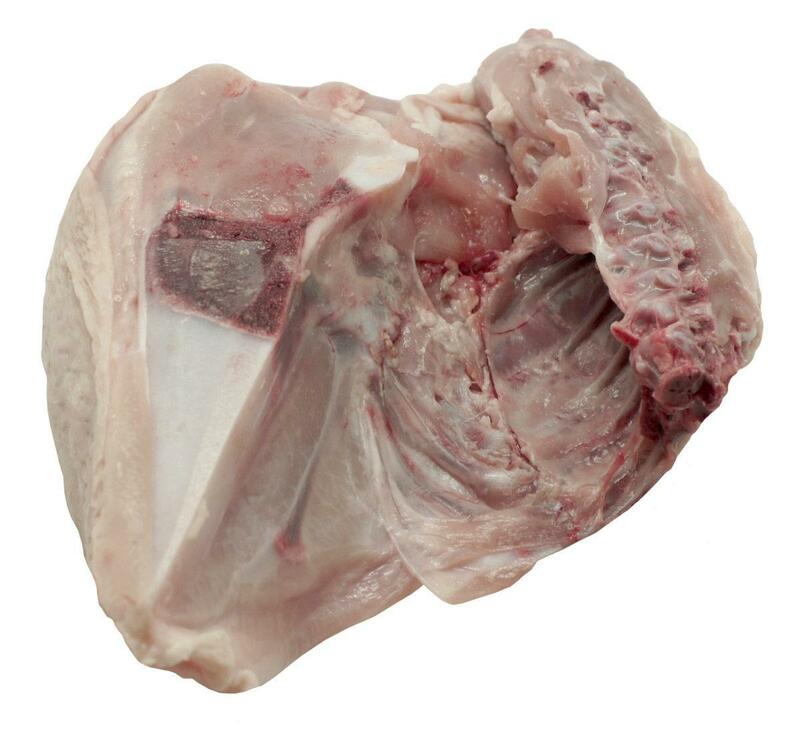 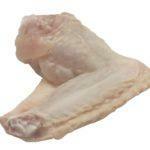 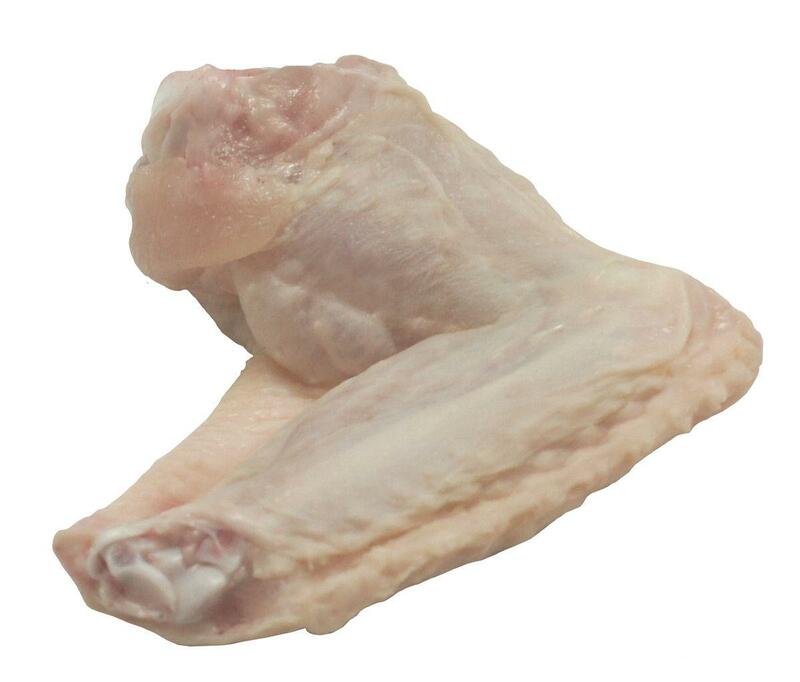 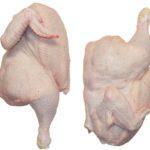 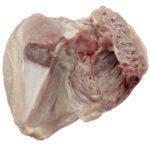 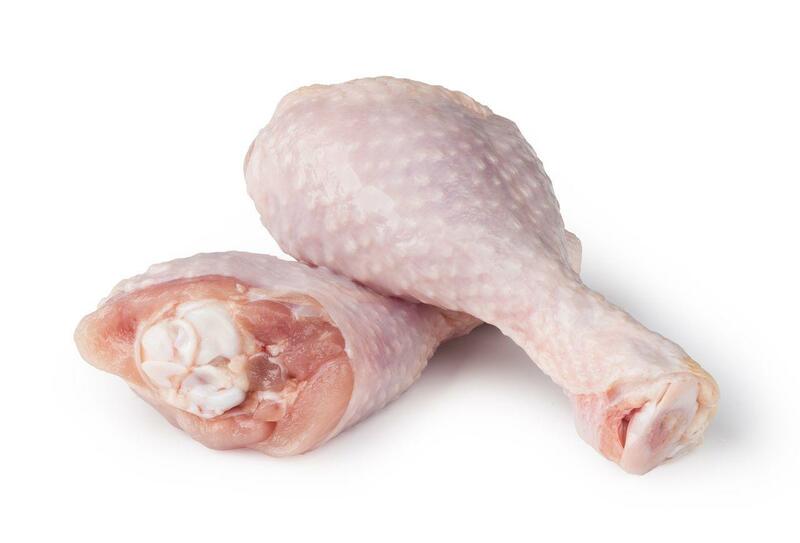 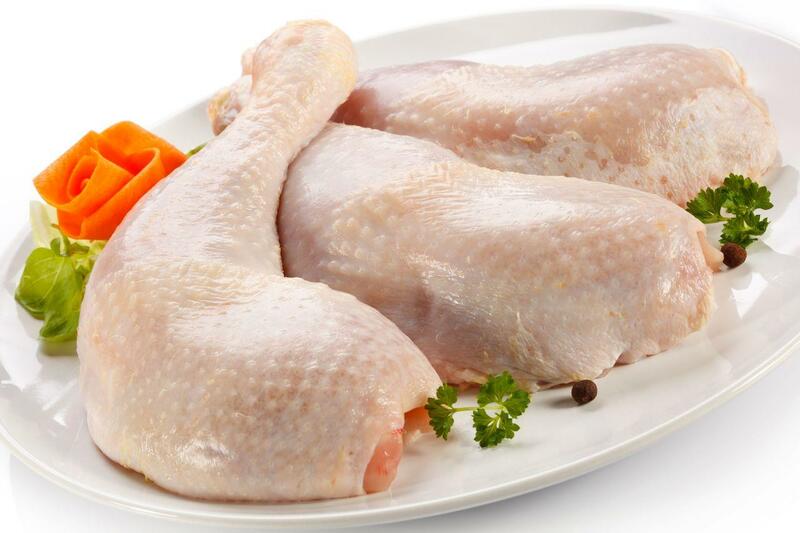 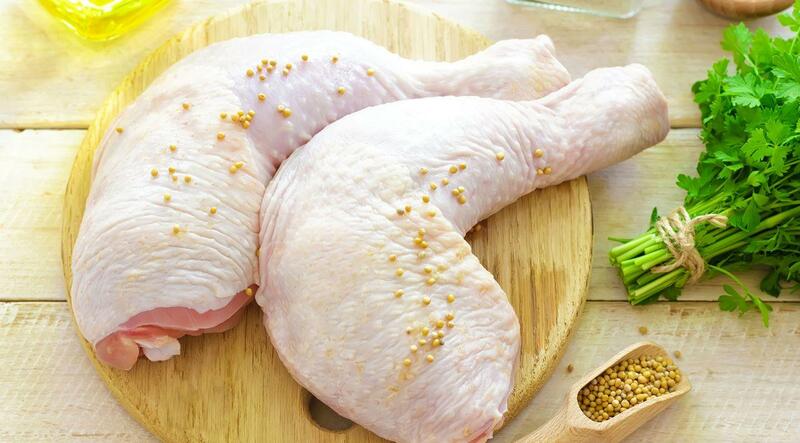 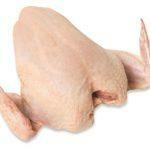 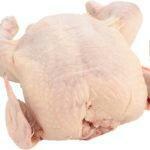 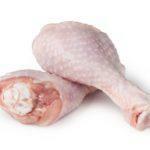 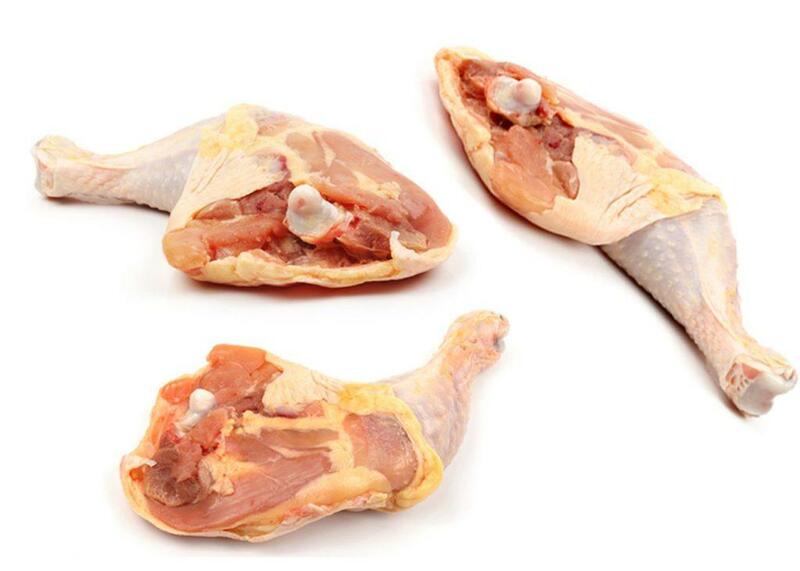 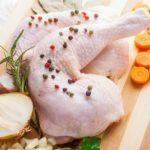 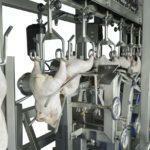 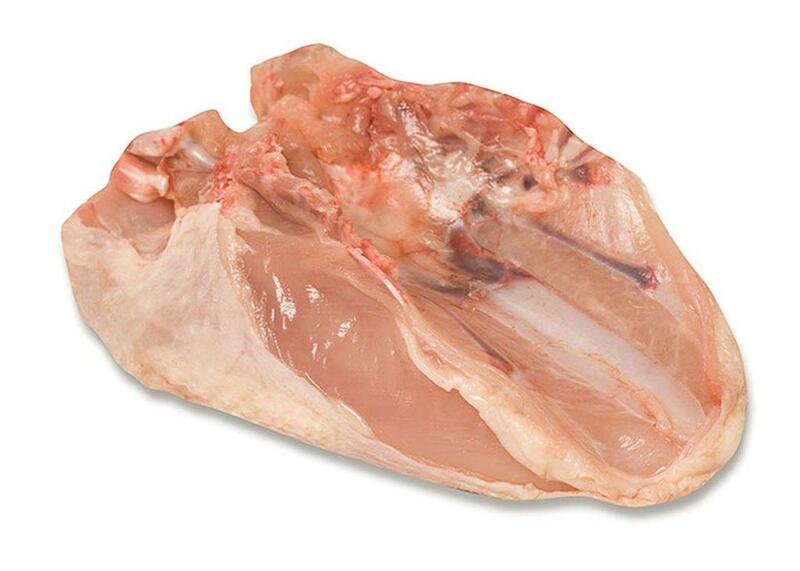 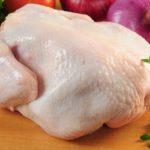 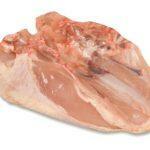 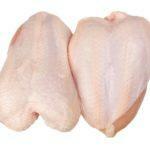 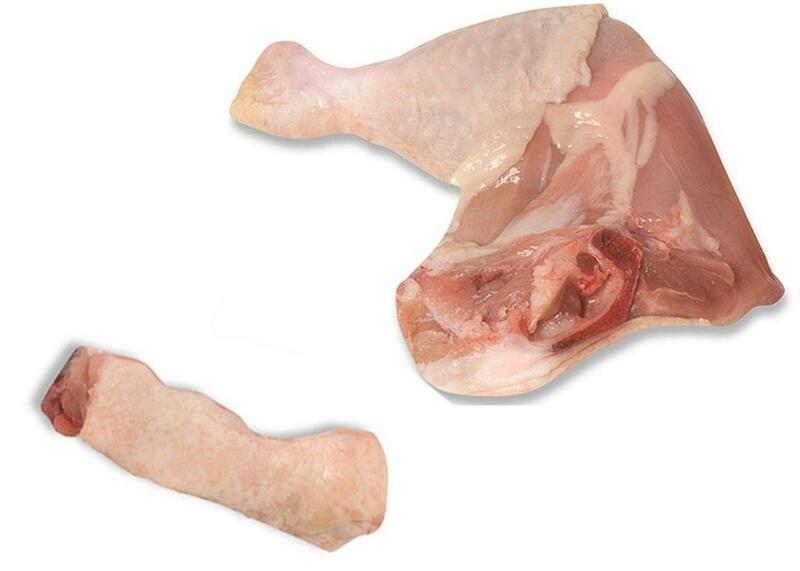 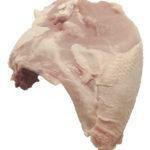 Foodmate has developed the OPTI Leg Processor to maximize bone-in and boneless dark meat yields. The machine gives a high yield anatomical cut and good meat and skin presentation. 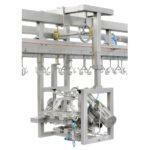 The new design is user friendly and provides low maintenance cost, as it has no springs or air cylinders. 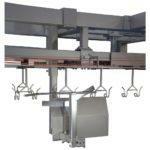 In addition, height is easily adjustable, which simplifies the process of accommodating different bird sizes. 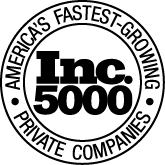 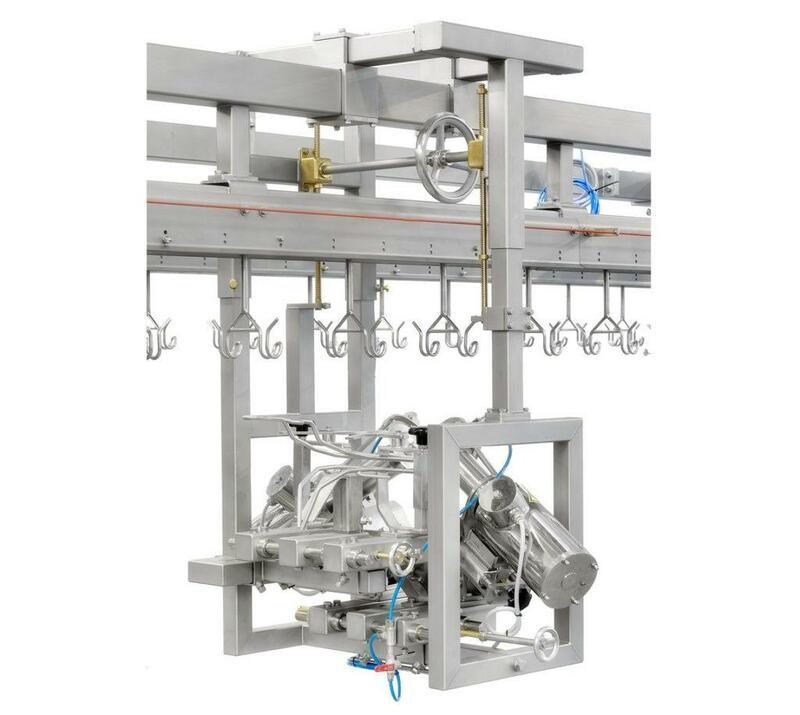 The machine was developed in the U.S., and though initially designed to address specific demands of the US market, this new version has proven to bring overall greater performance, benefiting costumers around the world. 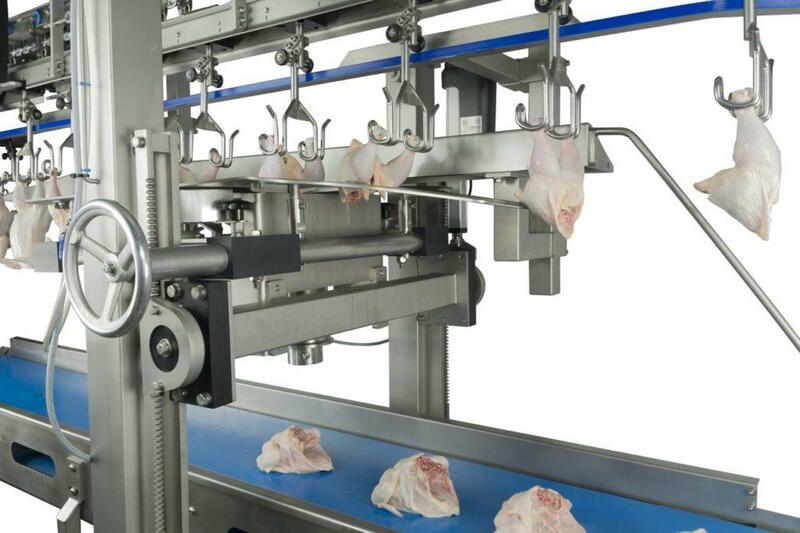 The OPTI Leg Processor can be installed in either a new Foodmate Cut-up System or it can easily be integrated into existing frame or flex type cut-up system. 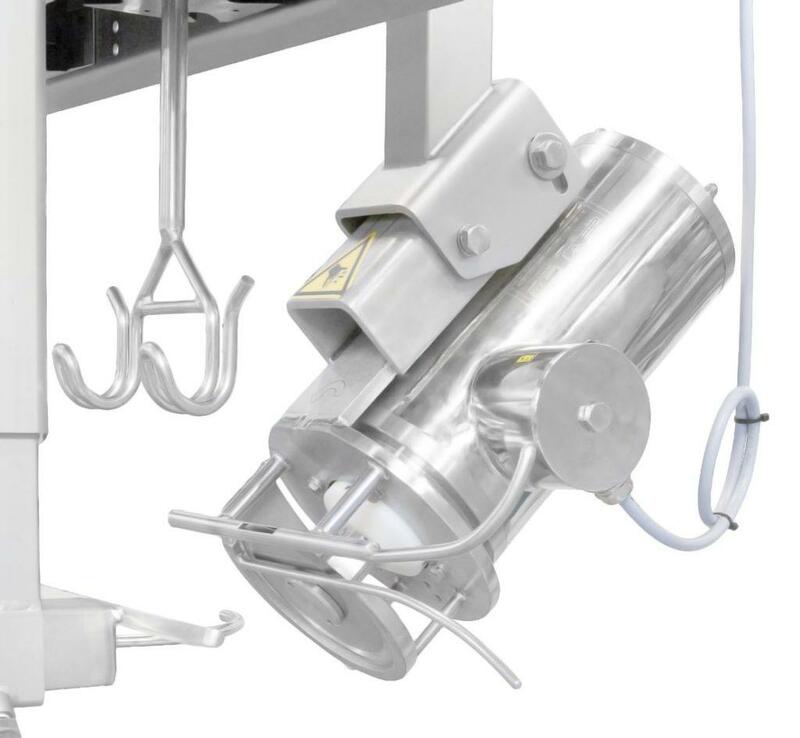 The OPTI Leg Processor can accommodate a wide size range while maintaining a high percentage of “white knuckles” and minimal bone content with minimal adjustments. 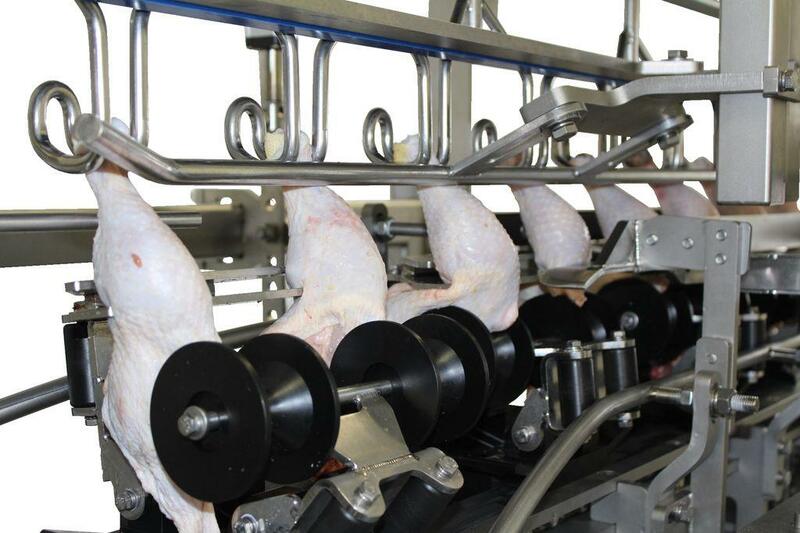 The OPTI Leg Processor can be adjusted to accommodate the so called “big birds” or large chickens. 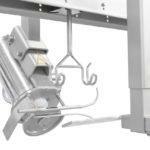 The OPTI Leg Processor can run up to 105 BPM. 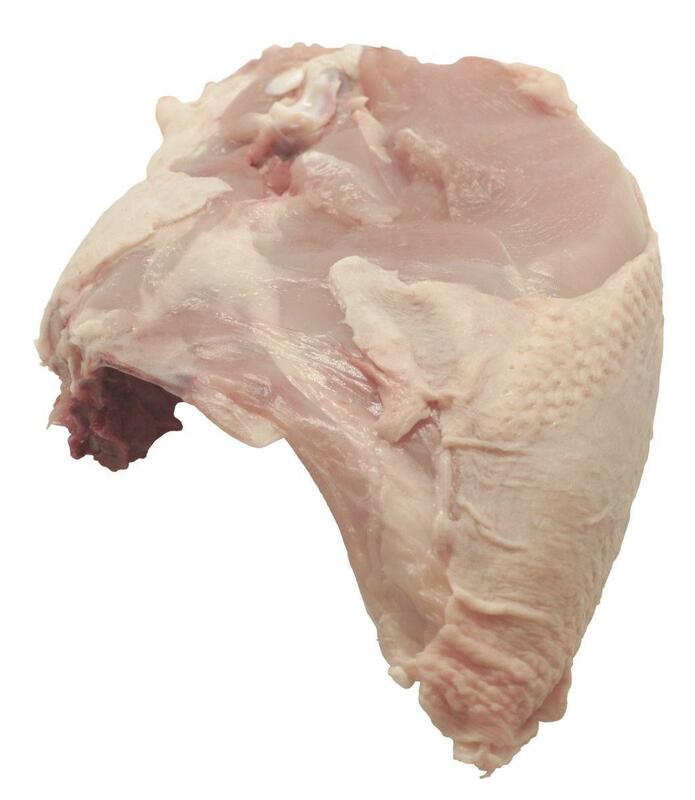 In addition, final product is consistent, with good meat and skin presentation. 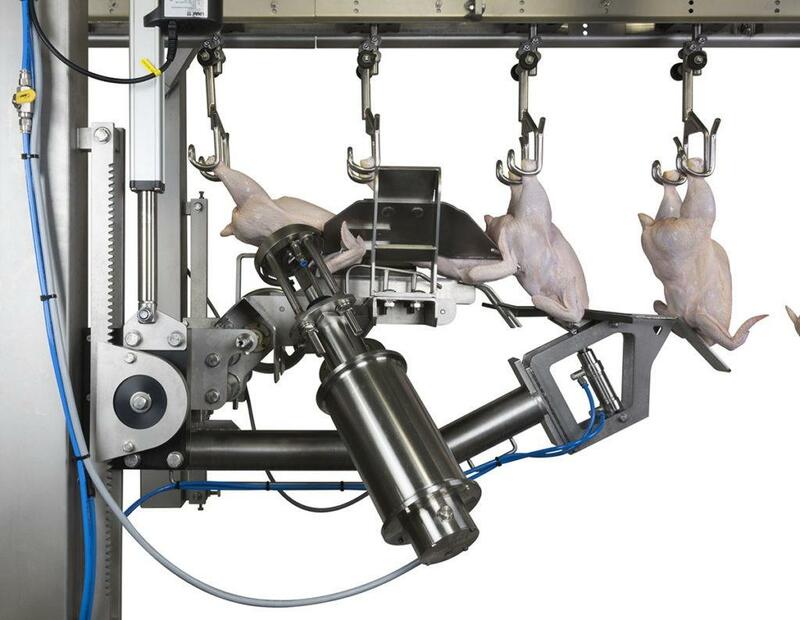 The OPTI Leg Processor delivers improved cut quality and yield performance as a standalone machine or when supplying product to the Foodmate Dark Meat Deboning System. The New Generation (NG) Thigh and Drumstick Cutter is a multi-purpose machine that can be used for both retail and food service applications. 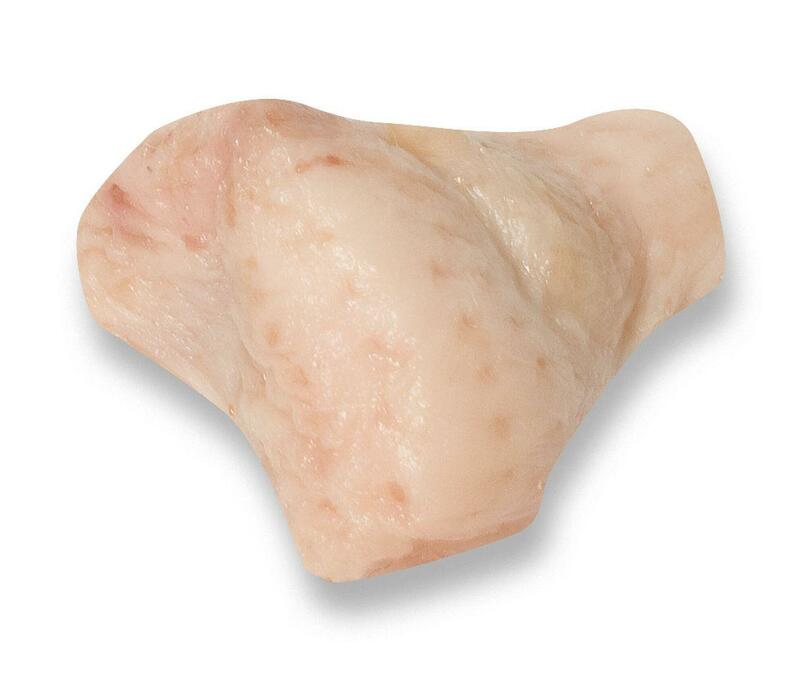 Specially designed to handle large size variations while ensuring the highest percentage of anatomical cuts. 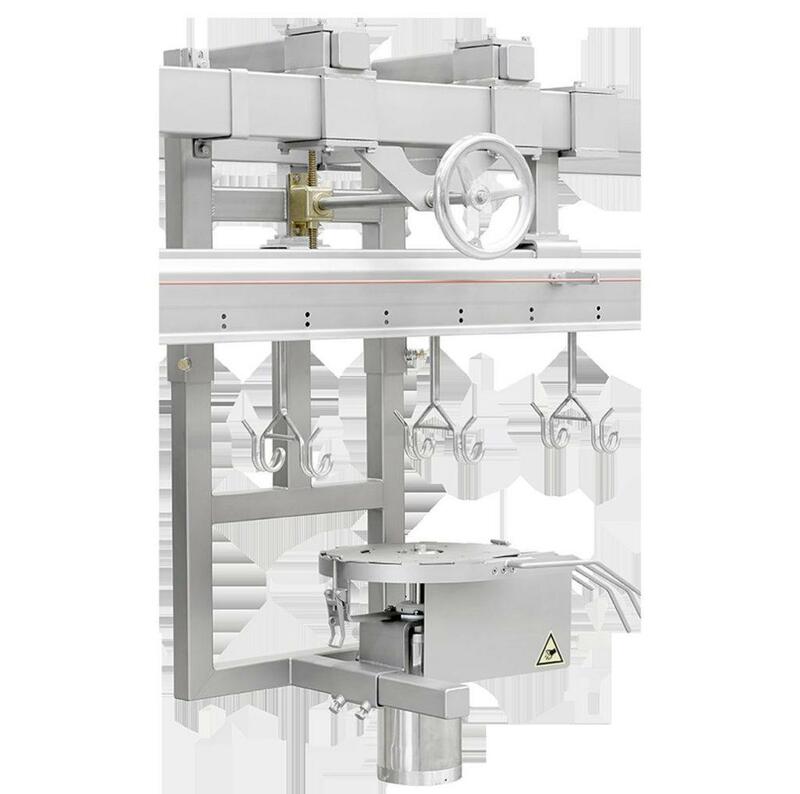 It has a simple construction design that contains no rebuild points, thus reducing the cost of ownership. 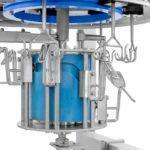 It provides an anatomic cut and depending on the type of cut, various configurations are possible. 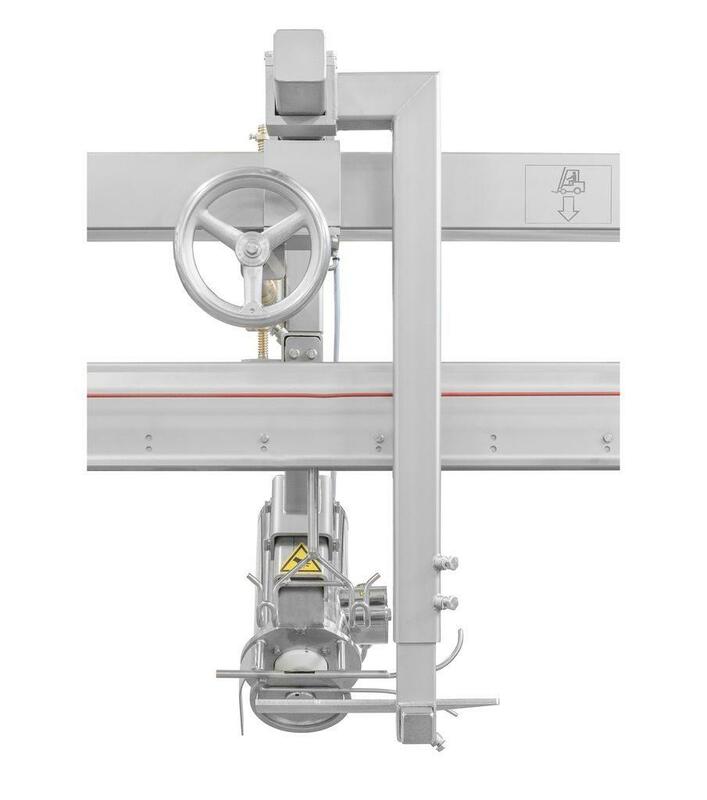 The electrical sync allows for more accurate cutting and the absence of a 90 degree gear box lowers maintenance costs. 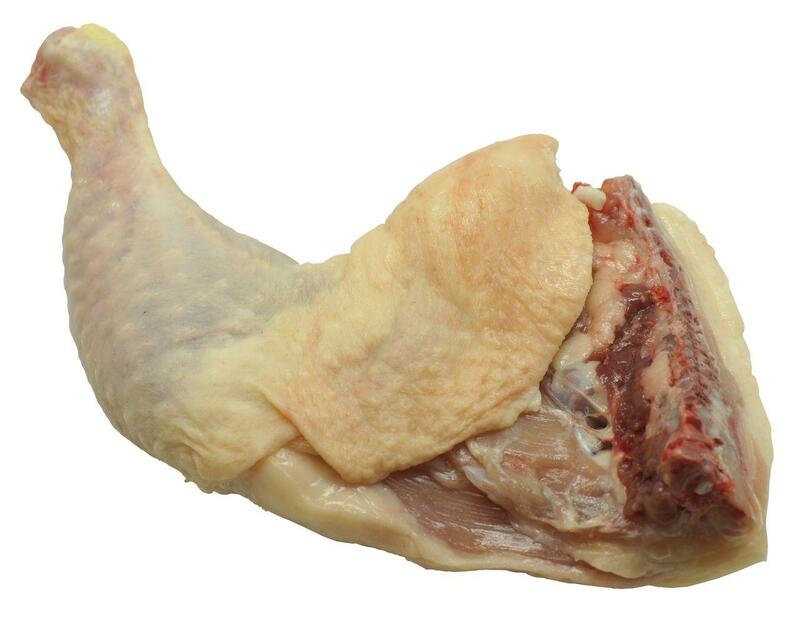 The Thigh and Drumstick Cutter is a multi-purpose machine that can be used for both retail and food service applications. 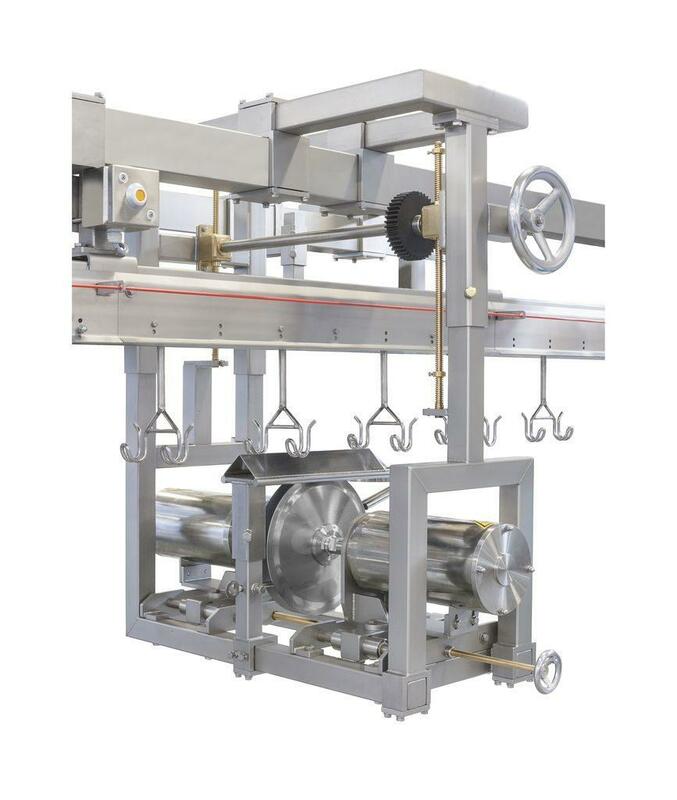 It has a simple construction design that contains no rebuild points, thus reducing the cost of ownership. 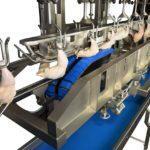 It provides an anatomic cut and depending on the type of cut, various configurations are possible. 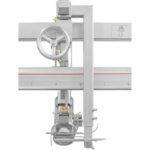 The electrical sync allows for more accurate cutting and the absence of a 90 degree gear box lowers maintenance costs. 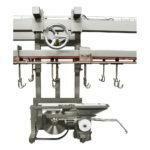 The Saddle Cutter 1 is the optimal machine to separate leg quarters. 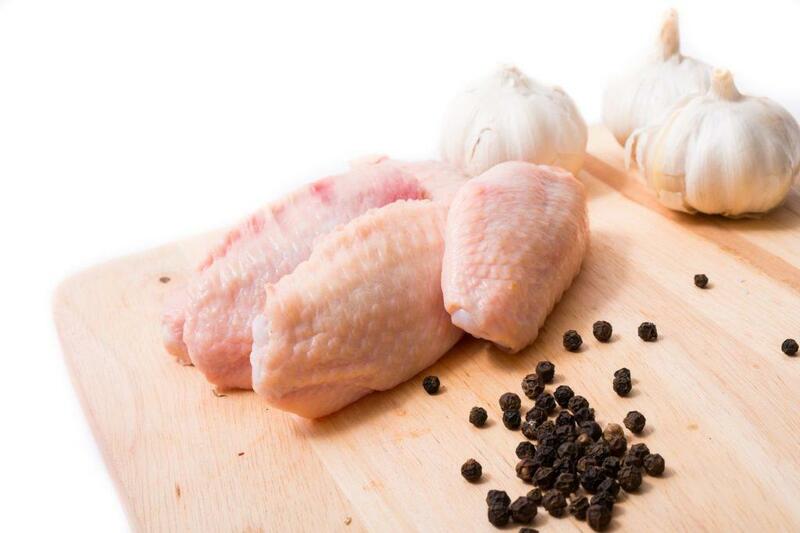 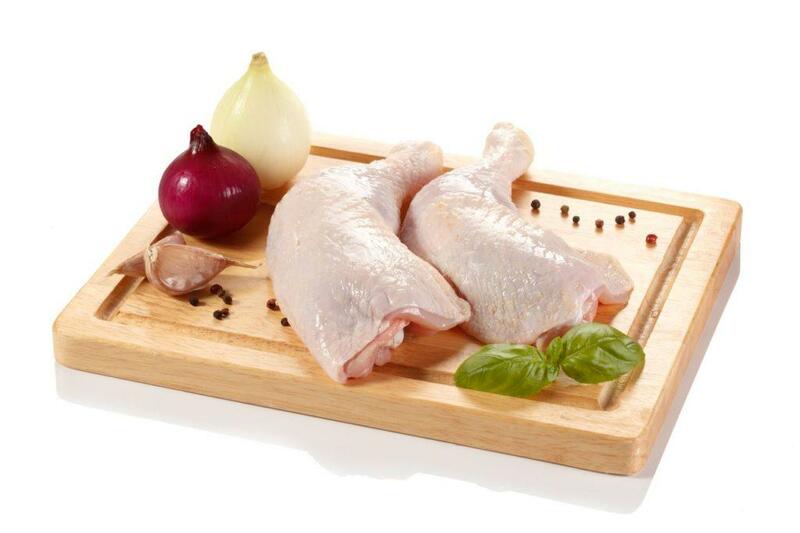 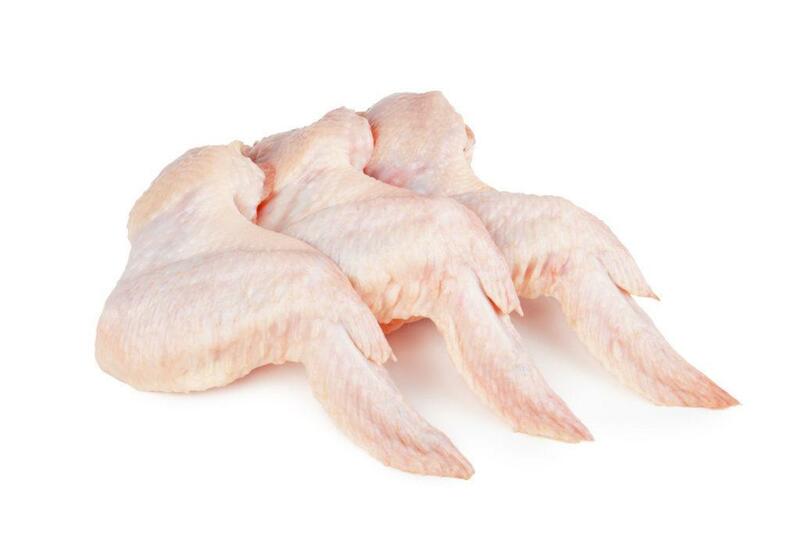 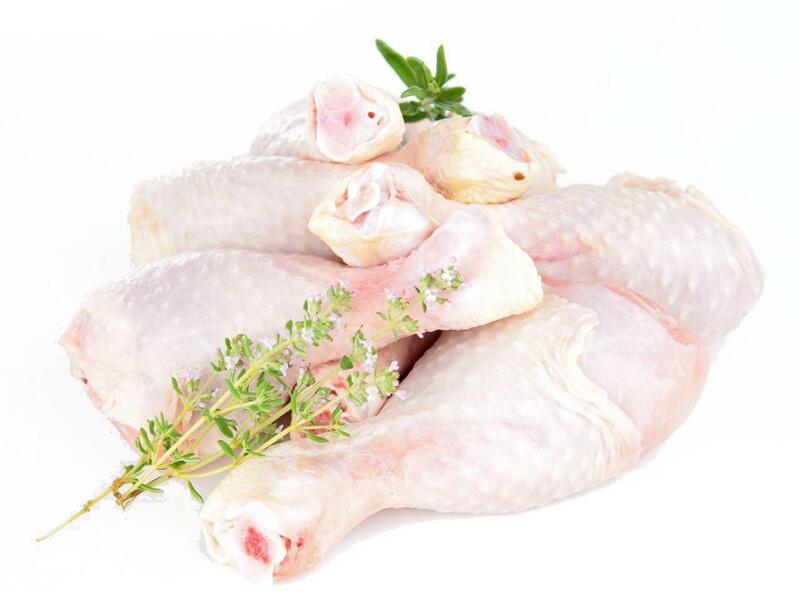 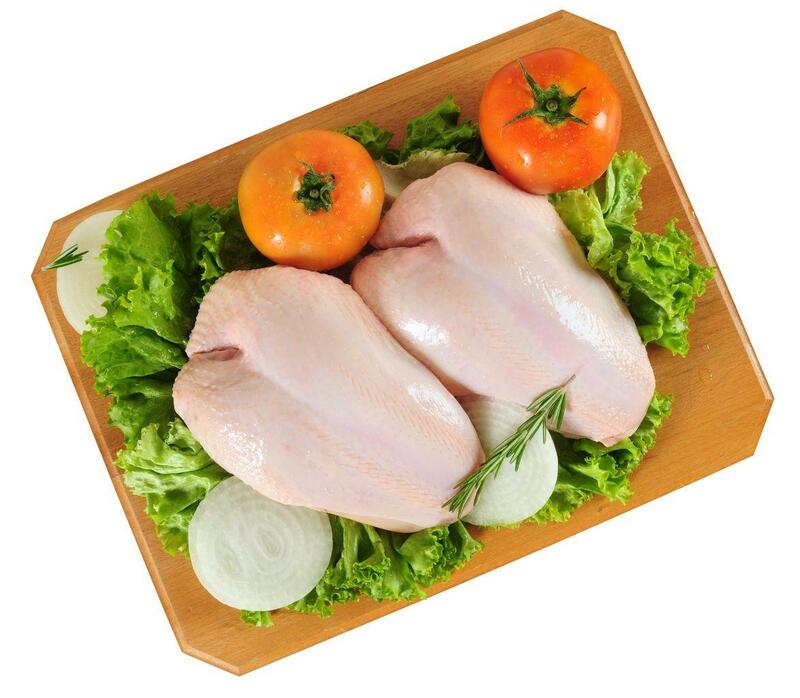 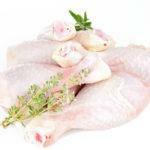 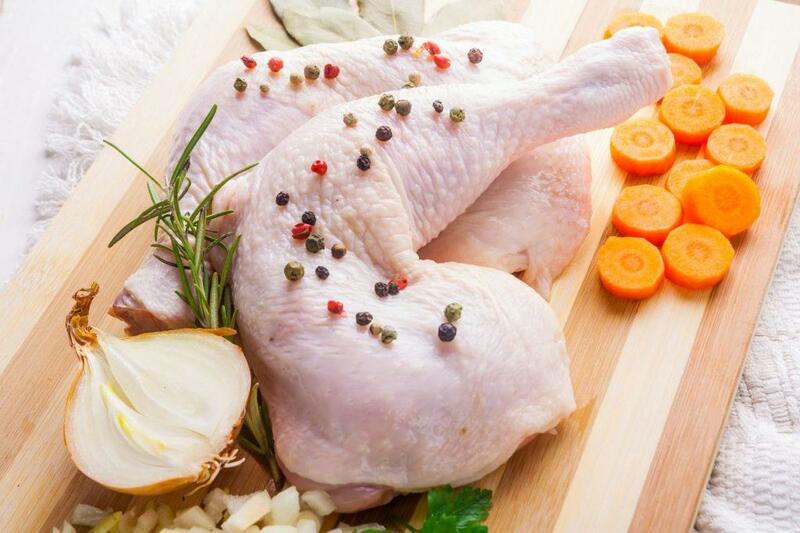 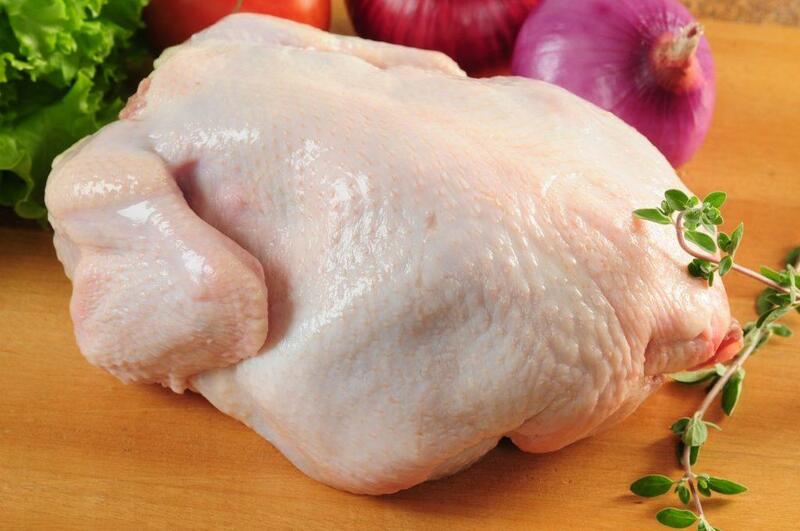 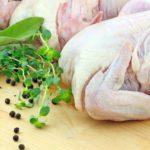 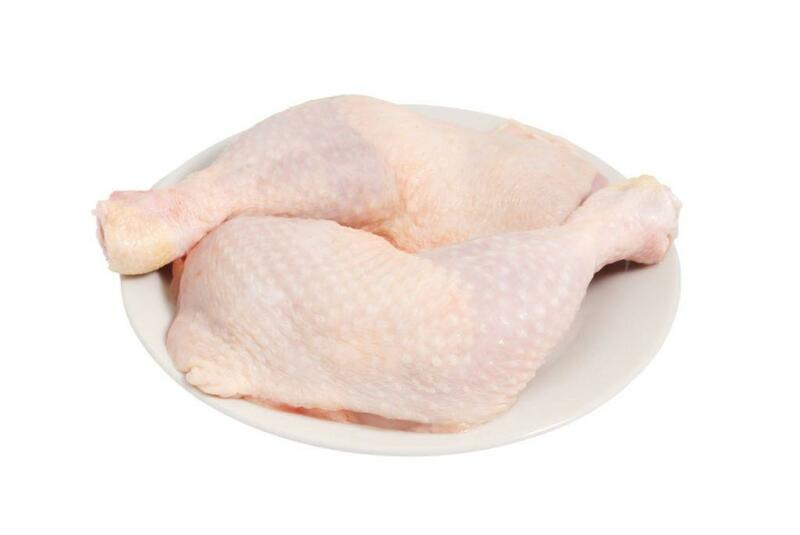 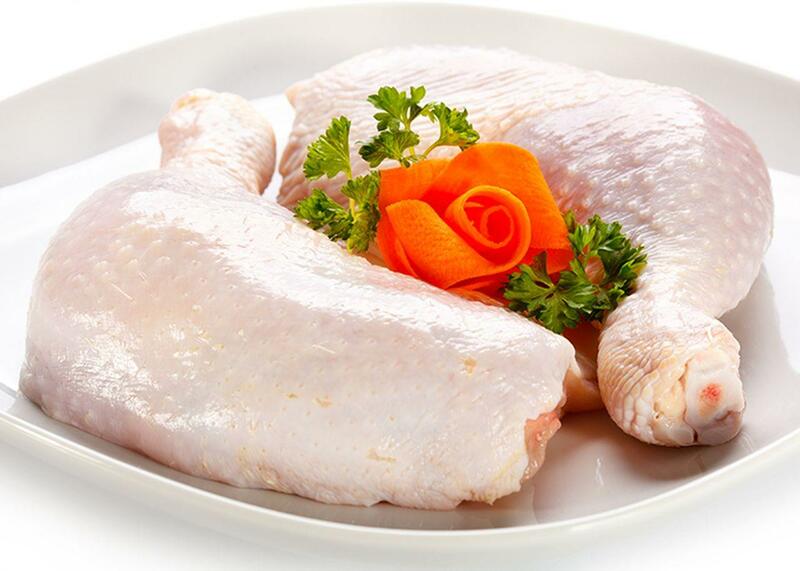 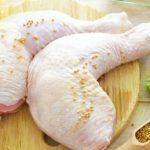 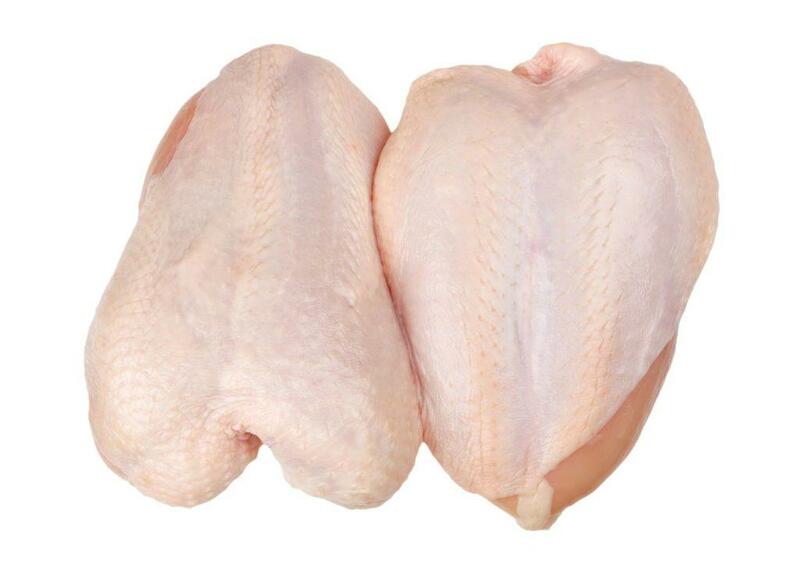 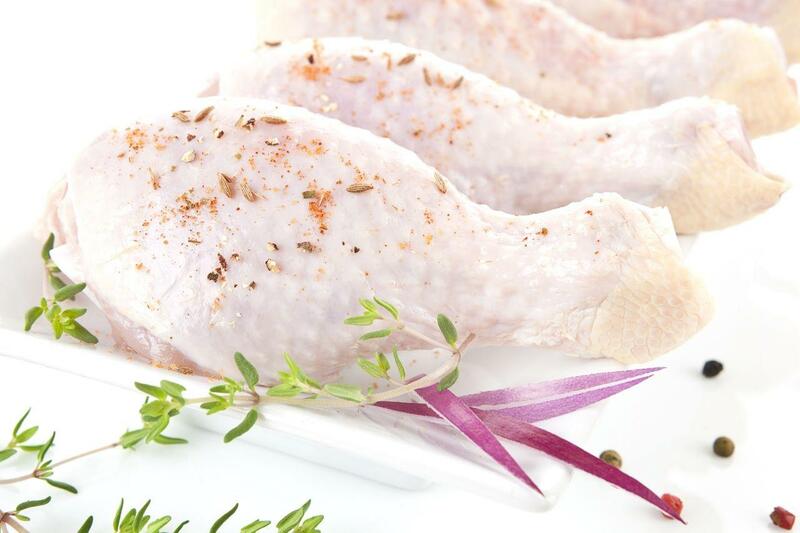 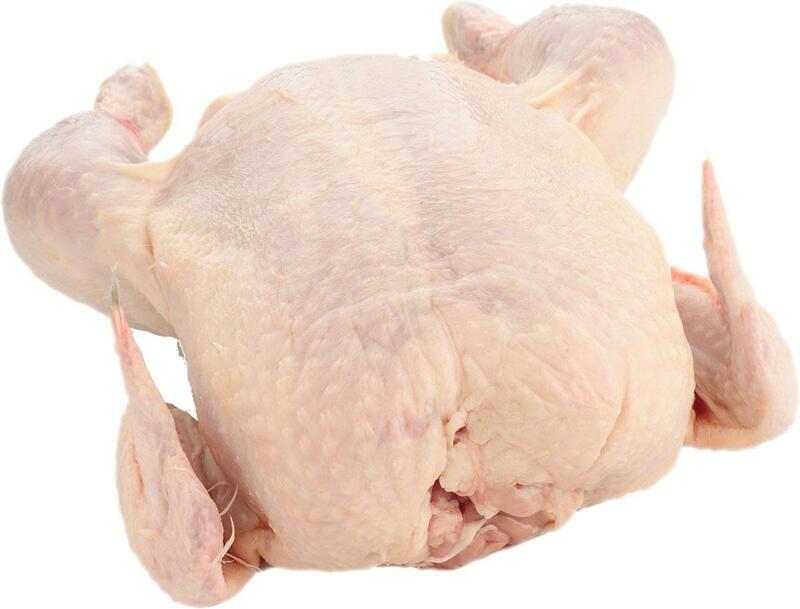 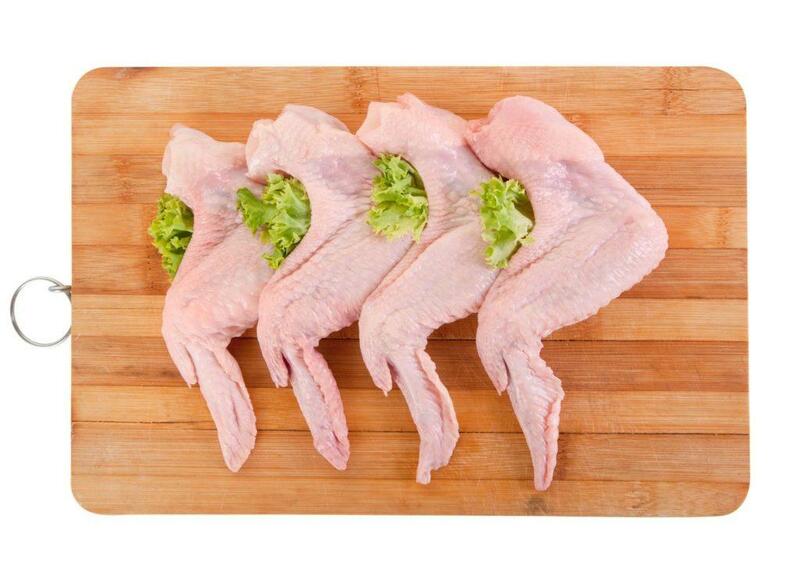 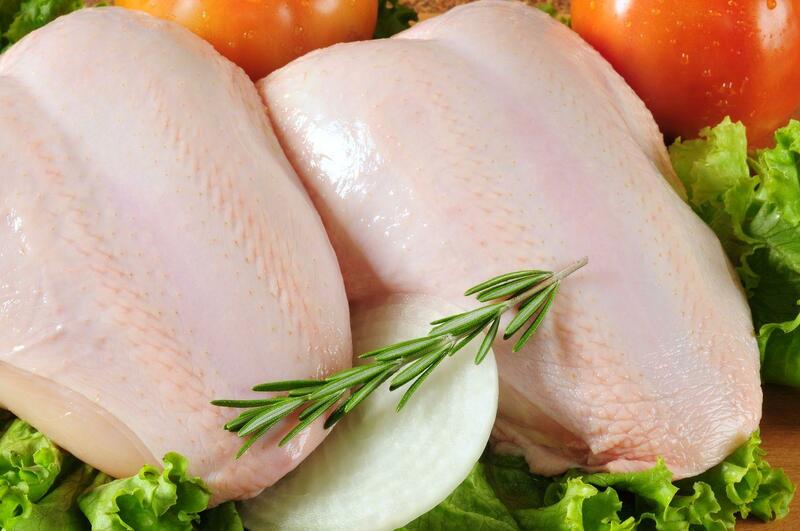 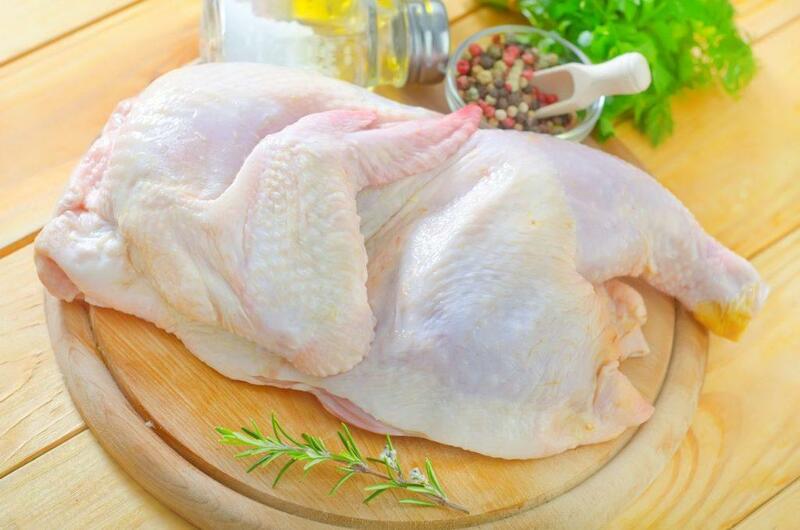 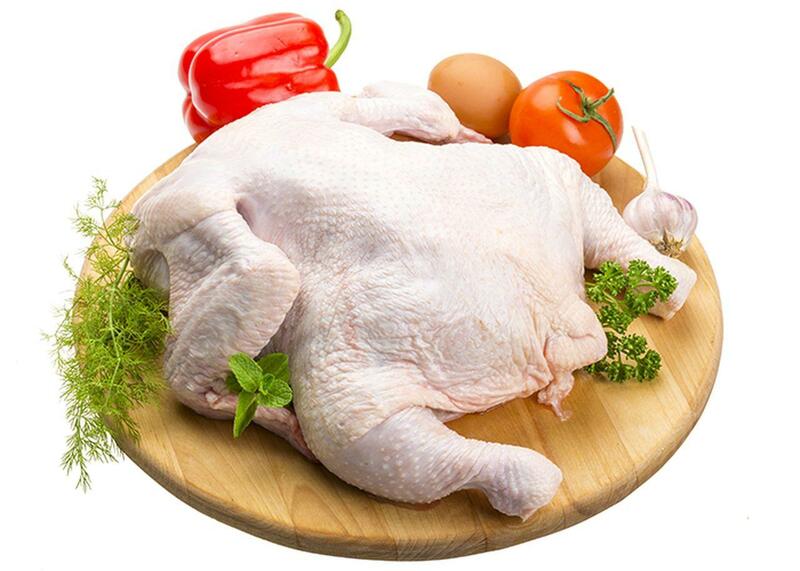 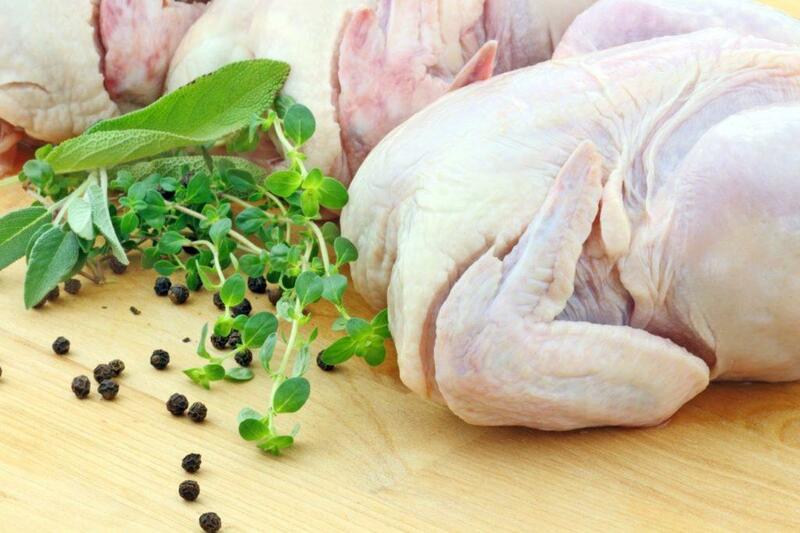 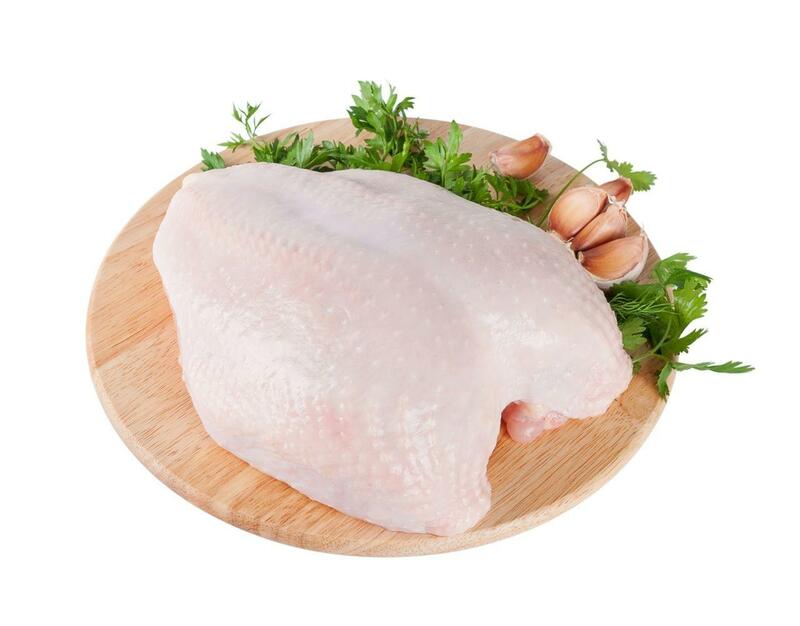 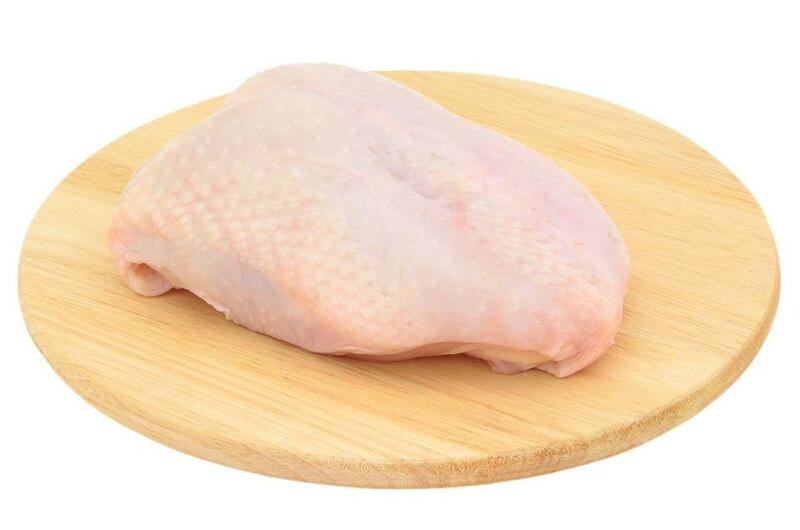 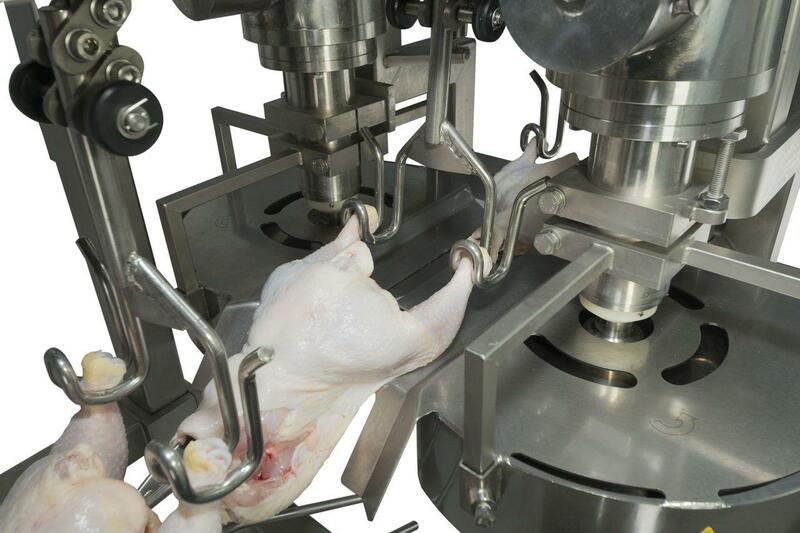 The guiding system is designed to always give an accurate center split.The chicken, hung on the Foodmate Cut-up line, is mounted parallel to the moving direction of the machine, with the breast in the direction of the circular blade(s) of the Saddle Cutter. 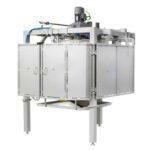 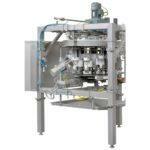 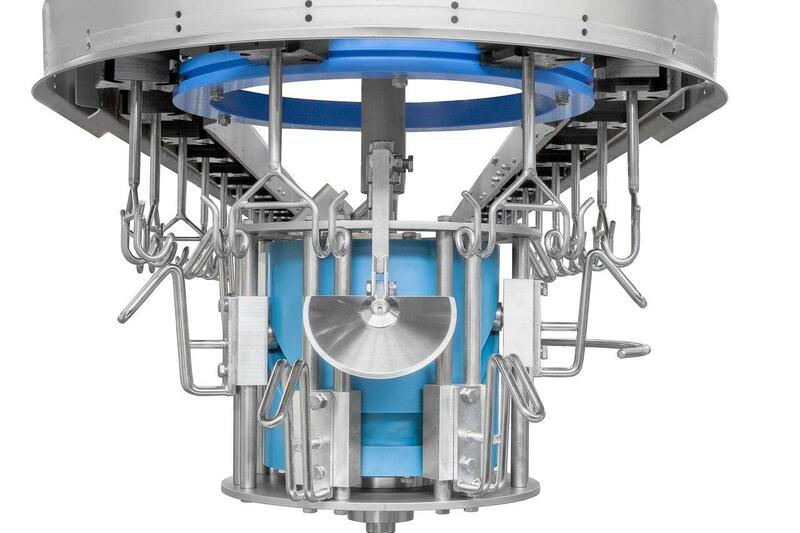 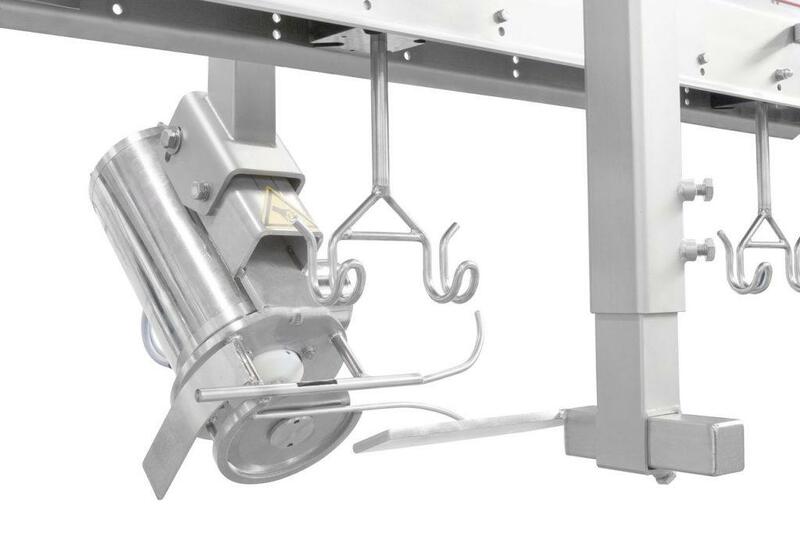 This module can be mounted on new Foodmate lines or added to existing lines. 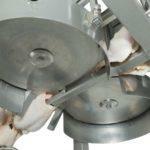 The Foodmate double blade Saddle Cutter with 2 motors can be used to do a single split of the leg quarters. 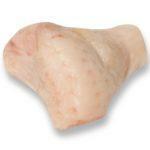 It can also be adjusted in many ways to cut a strip of up to 5 cm out of the back bone. 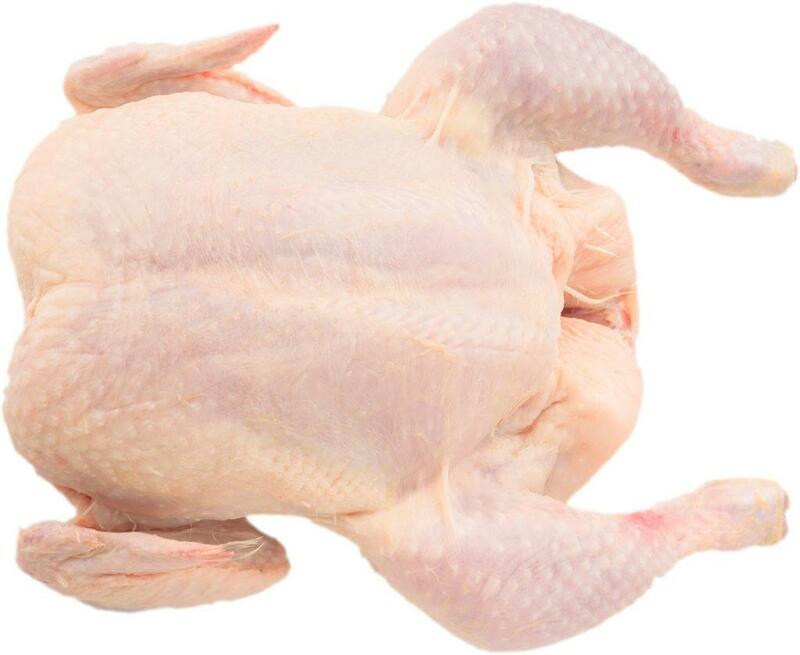 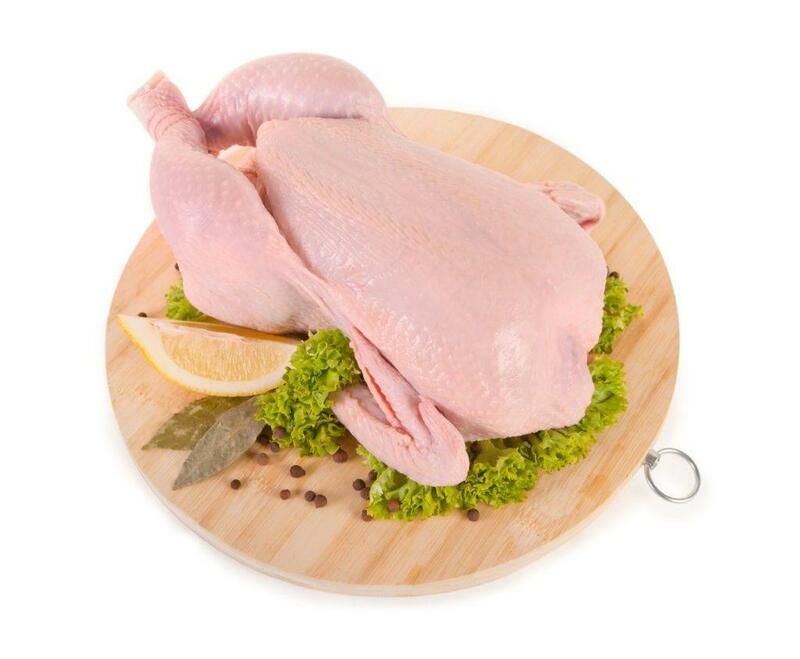 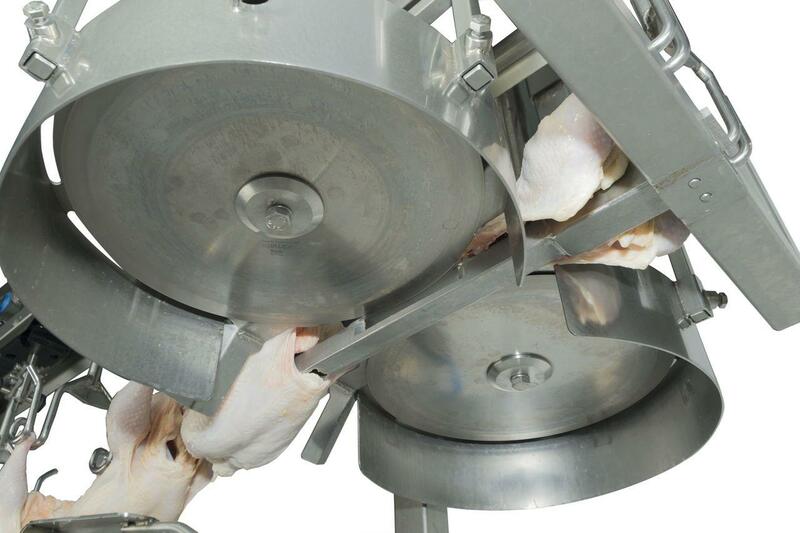 The chicken which is hanging on the Foodmate Cut-Up line is mounted parallel to the moving direction of the machine, with the breast direction of the circular knife of the saddle cutter. 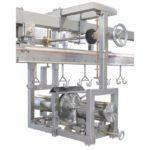 Because of the movement of the Cut-Up line and the help of the rails, the right cut is realized. 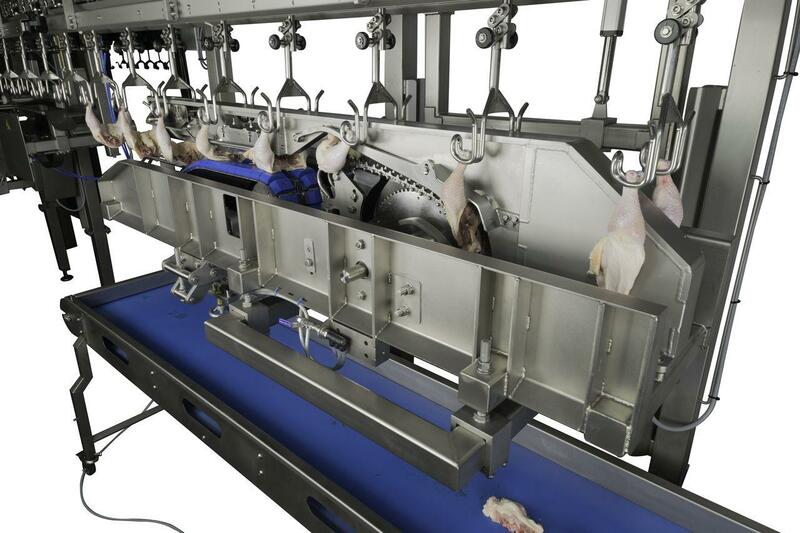 The height of the blades can be adjusted by adjusting the spindles, so they can be adjusted according to the size of the bird. 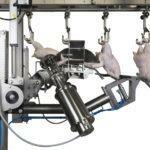 It can also be installed on a existing Cut-Up lines. 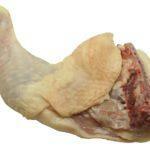 The Foodmate Tail Cutter automatically removes the tail from the back. 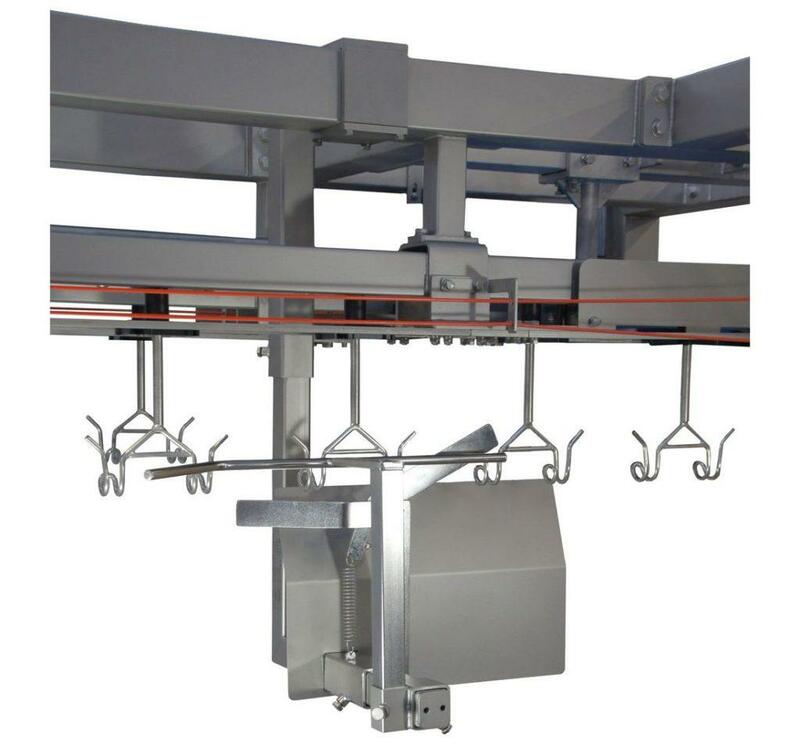 The unit can be placed in different locations in the line. 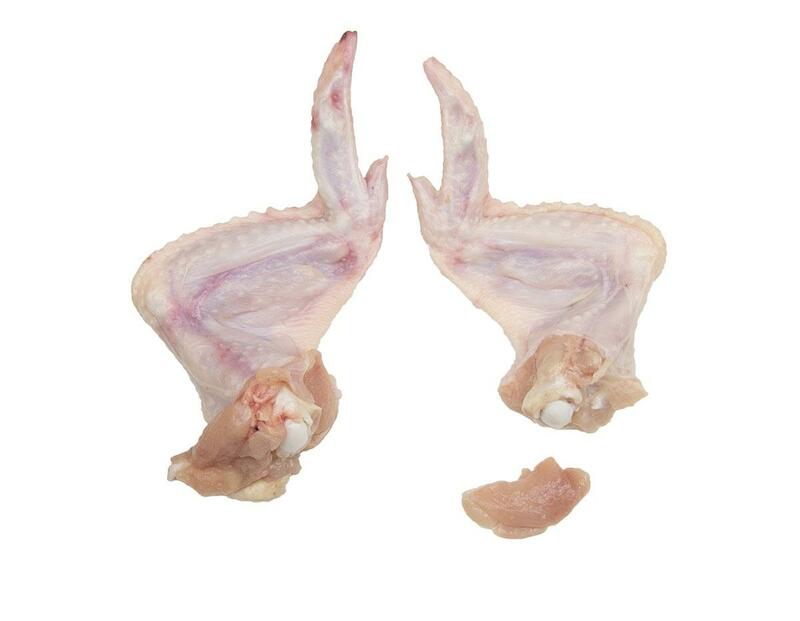 The Tail Cutter is designed to allow maximum yield and minimum damage to both back and tail. 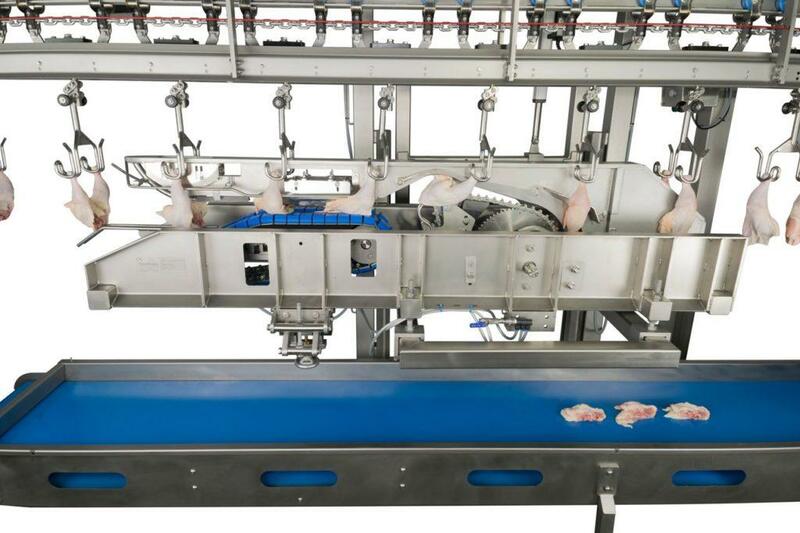 The machine is installed in the Foodmate Cut-Up Line. 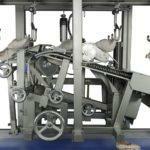 The machine is designed to separate the tail from the bird to be further processed. 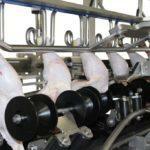 When the bird enters the machine, the bird is guided by rails to a circular blade. When the bird passes the blade, the tail is cut off and the bird is transported to the next module. 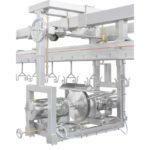 It can be placed on a flex or frame line. 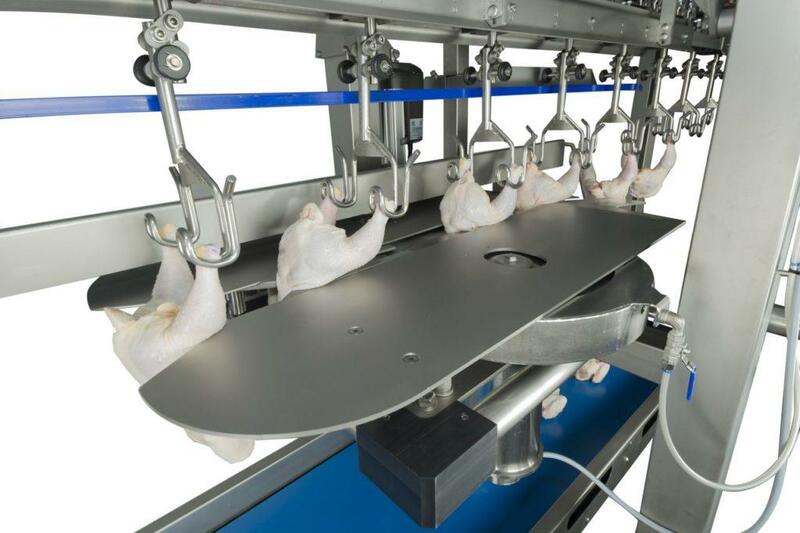 The Foodmate Wing Stretcher is designed to position and stretch the wings of the bird into the right position for the following machines to work properly. 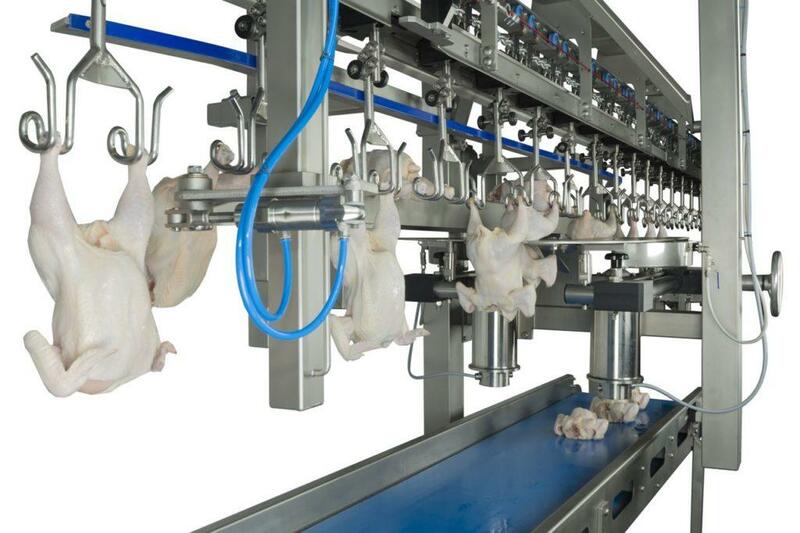 When the bird approaches the machine, the bird is facing the machine breast first. 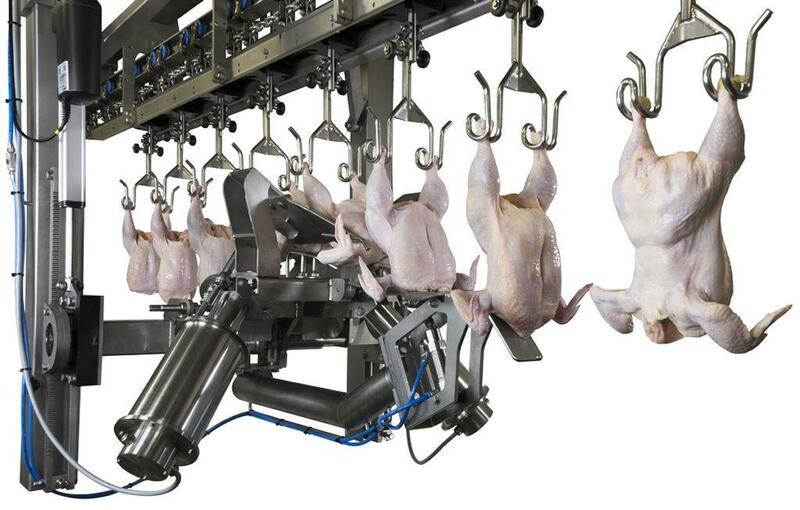 A guiding rail positions the bird. 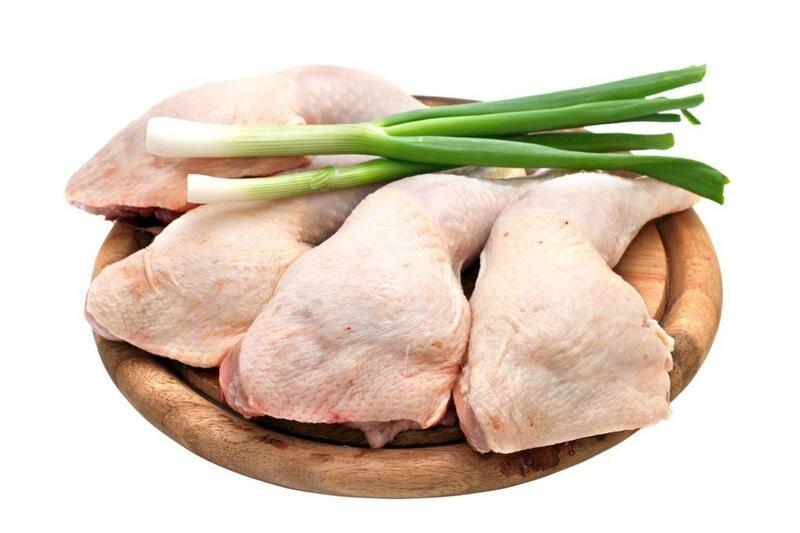 Two other rails are placed in such a way that they will slide between the bird and the wings. 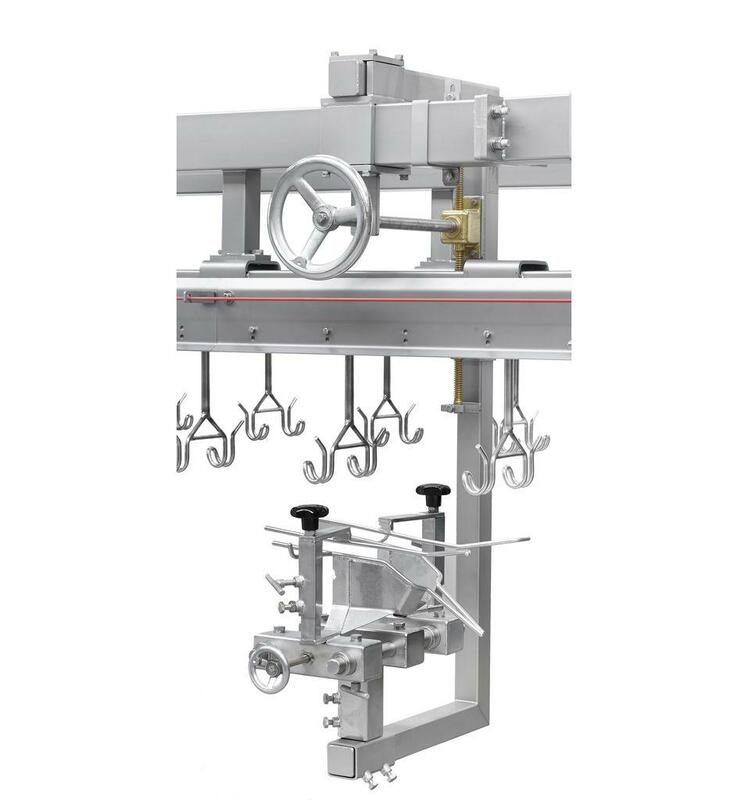 The new Foodmate AFS (All Food Service) Wing Cutter is designed to meet the latest requirements for major fast food chicken restaurants. 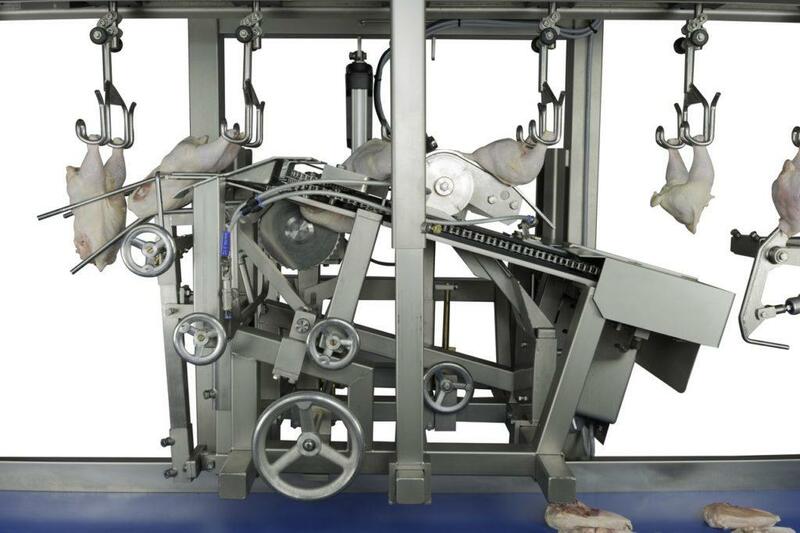 The machine is capable of cutting both new requirements and traditional Silver Dollar style with just a minimum adjustment. 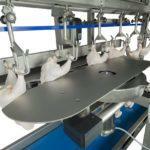 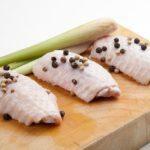 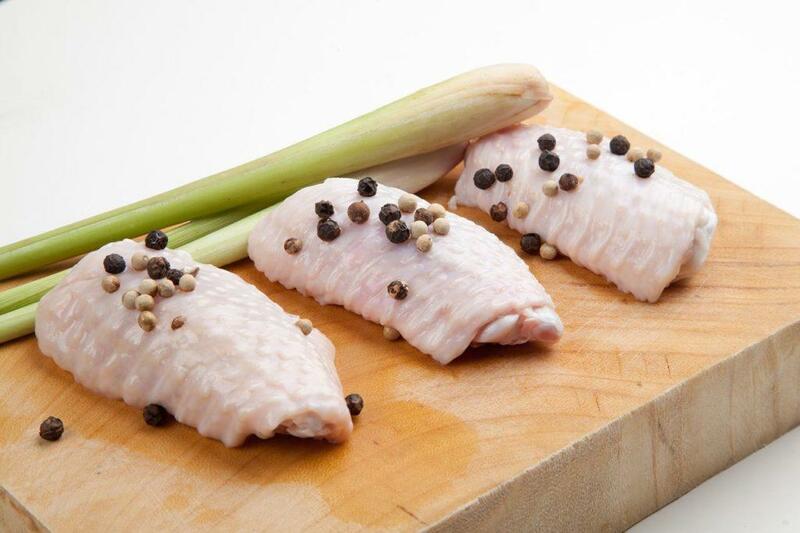 The AFS Wing Cutter can be installed into most existing Cut-Up lines and on a new Foodmate Food Service Cut-Up System. 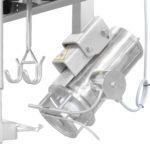 The Foodmate Fat Puller is a stainless steel constructed, automatic fat remover. The remaining fat will be removed by a screw and in combination with a vacuum system, the fat will be removed and transported to a offal tank. 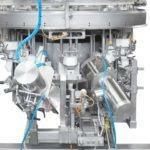 There is also a cleaning option to clean the vacuum unit with water after production. 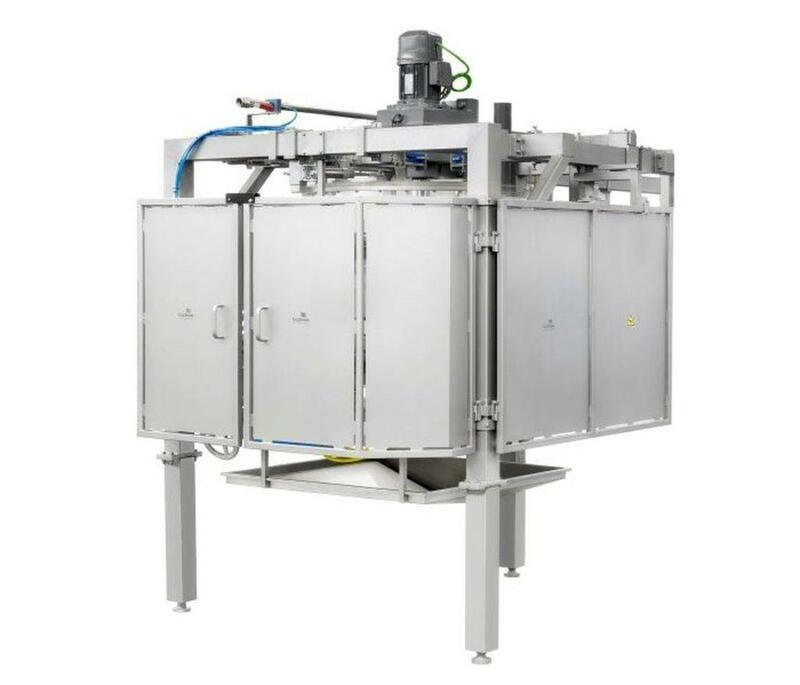 The Foodmate Precut Unit is a stainless steel constructed, automatic precut unit. 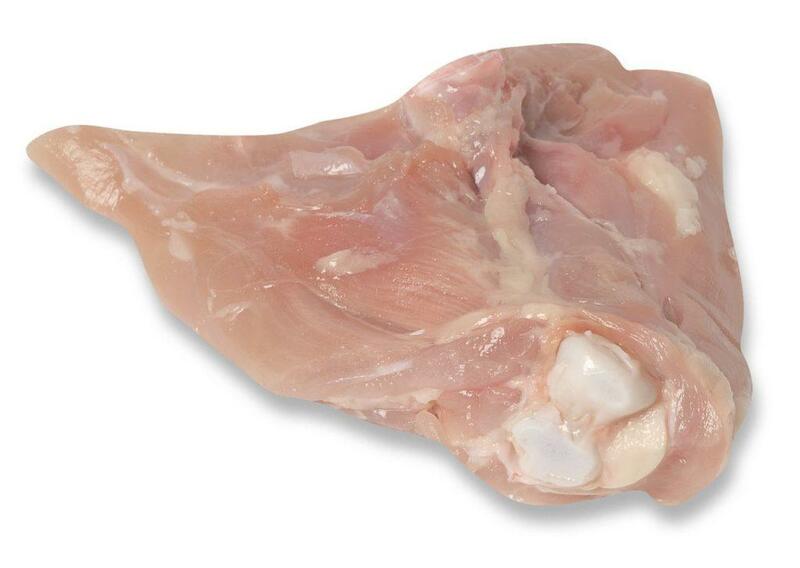 The Foodmate Keelbone Cutter was designed specifically for the 9-piece Food Service Cut-up System. 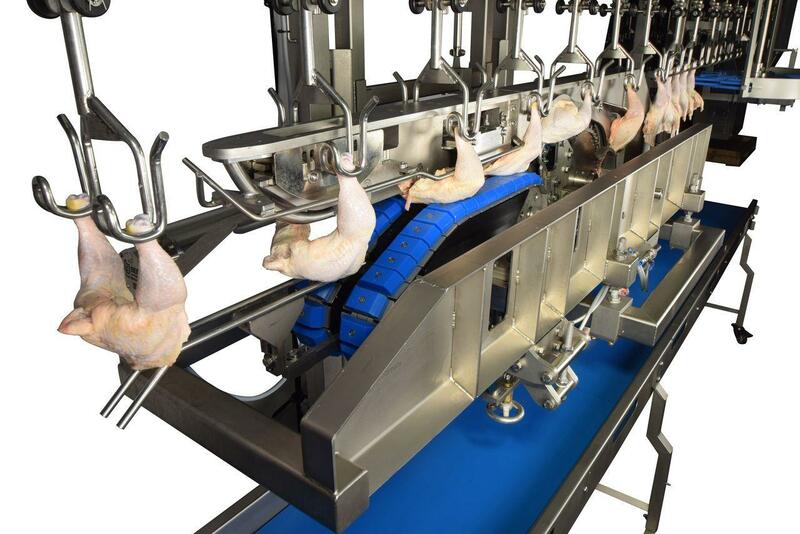 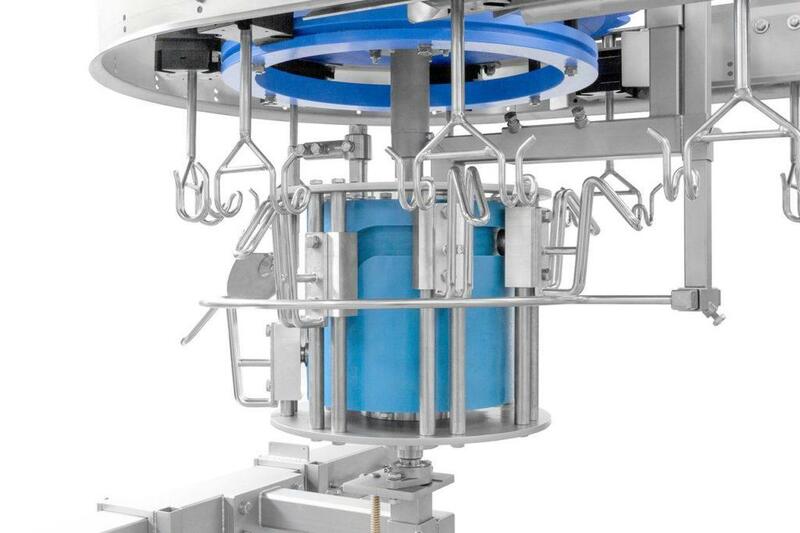 It automatically separates the breast from the neck, shoulders, back and saddle of birds while the birds are moving along the frame line, delivering the desired breast cut, allowing the bird to progress to the other modules without interruption. 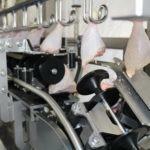 The Foodmate Flexible Unloader is designed to unload legs or drumsticks from the cut up shackle. 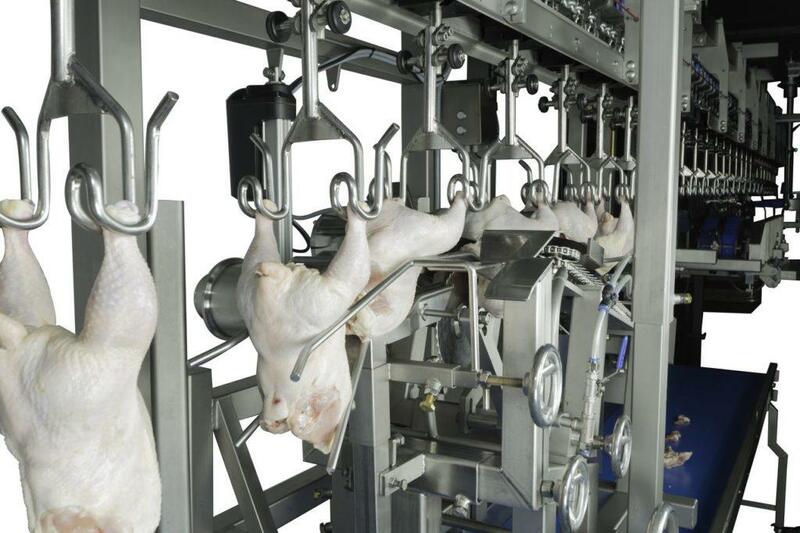 When the shackles pass the Unloader, legs or drumsticks will be unloaded by a guide bar system. 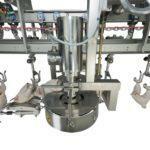 The unloaded parts can drop into a bin or on a conveyor belt. 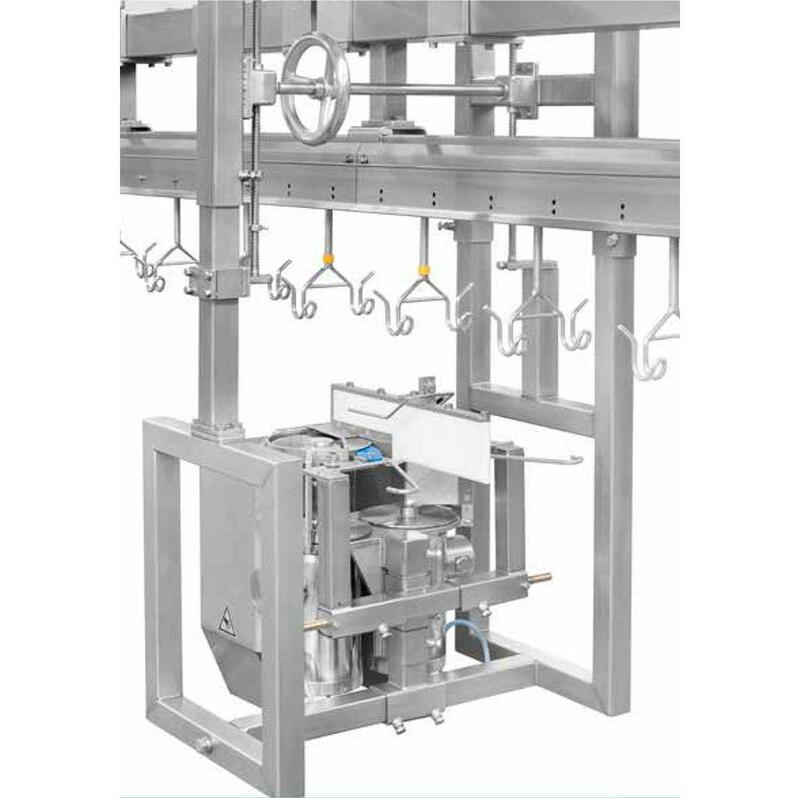 The Flexible Unloader can be installed on current figurations or newly constructed Frame and Flex Lines. 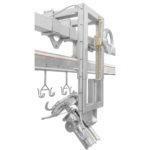 Allows for easy adjustments due to the simple construction and no moving parts. 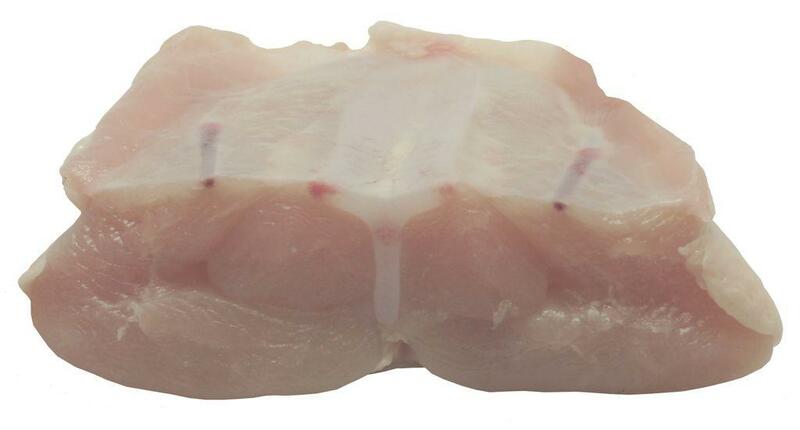 The Foodmate Neckskin Cutter is designed to cut off neckskins on the cut-up line. 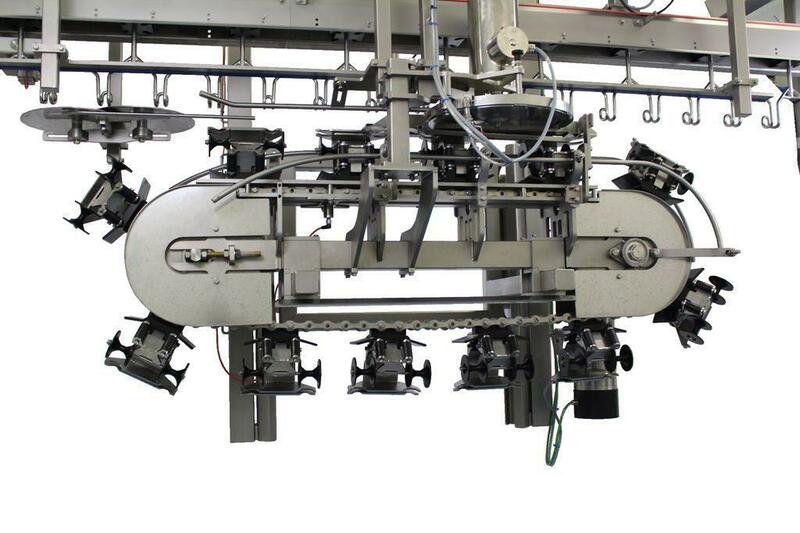 Flexibility is built into the design allowing for height adjustments to accommodate the different cut lengths. 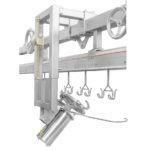 The Neckskin Cutter can be installed on current figurations or newly constructed Frame and Flex Lines. 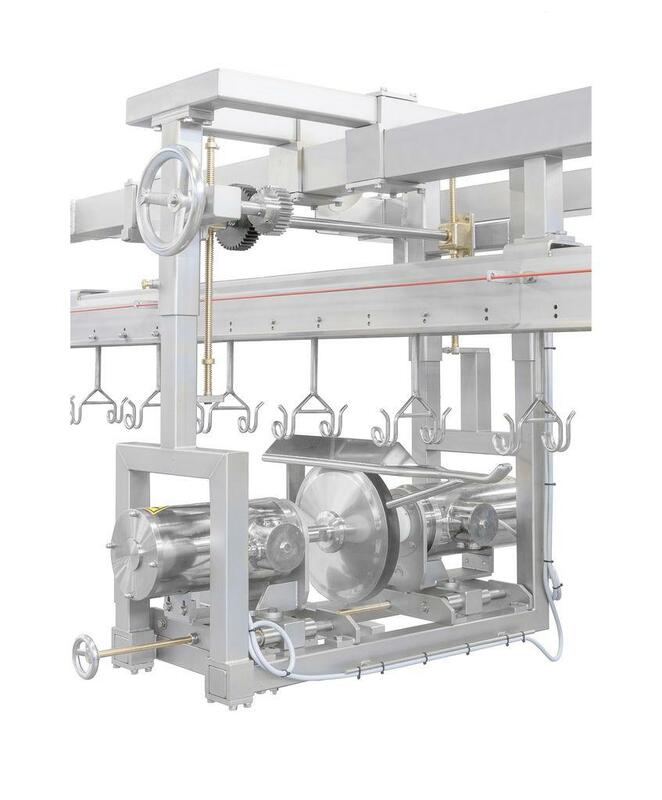 It contains a stainless steel frame and motor.